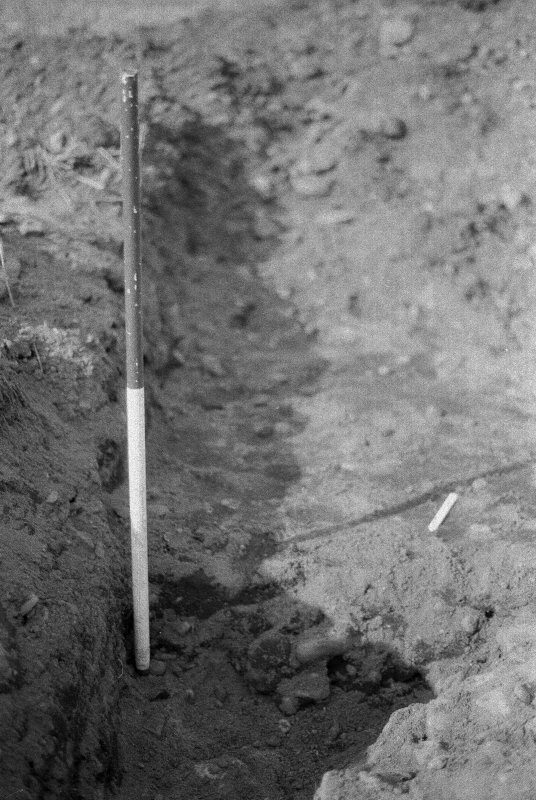 Slide 1/29. 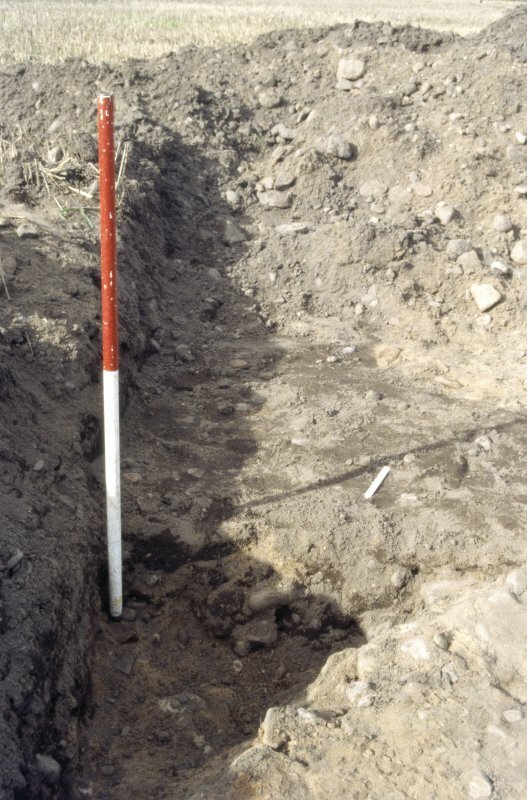 Trench A 1012. 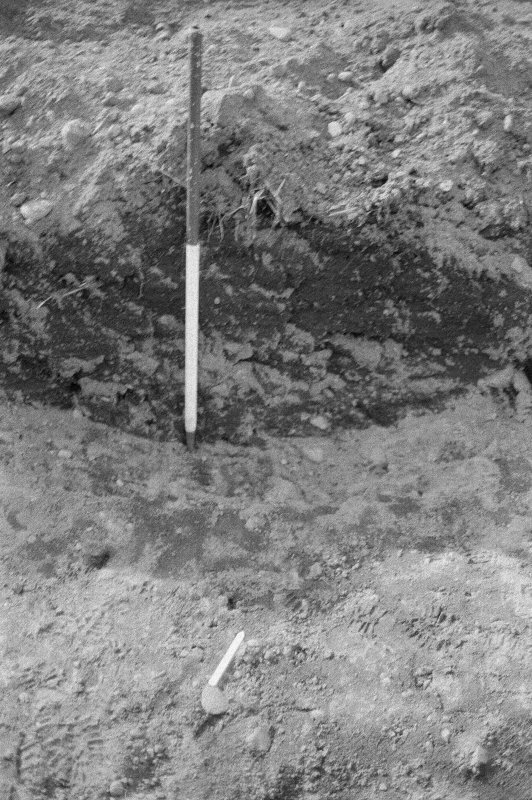 Slide 1/30. 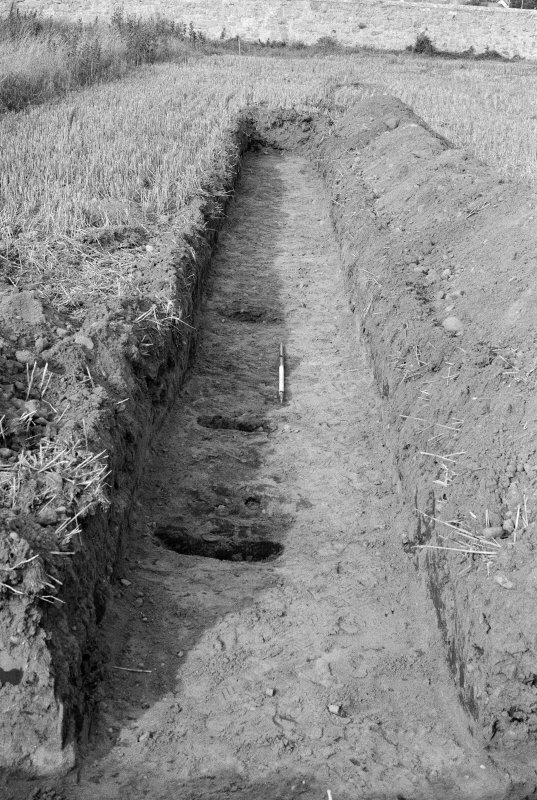 Trench A 1014. 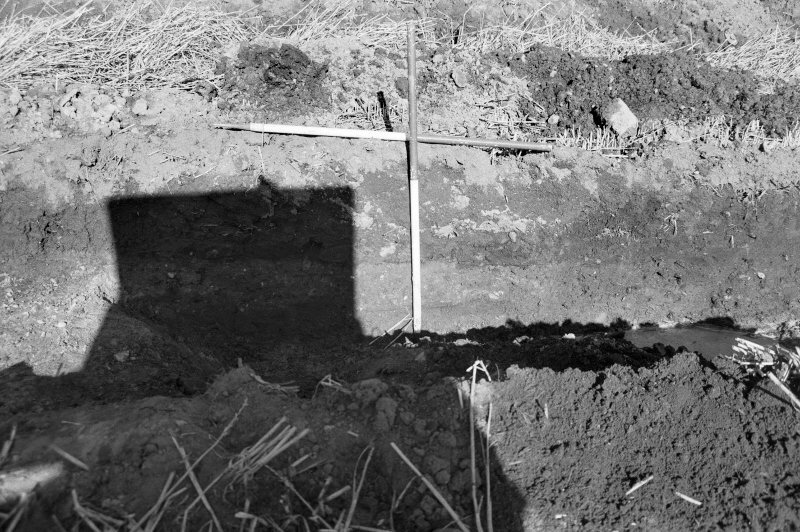 Slide 1/27. 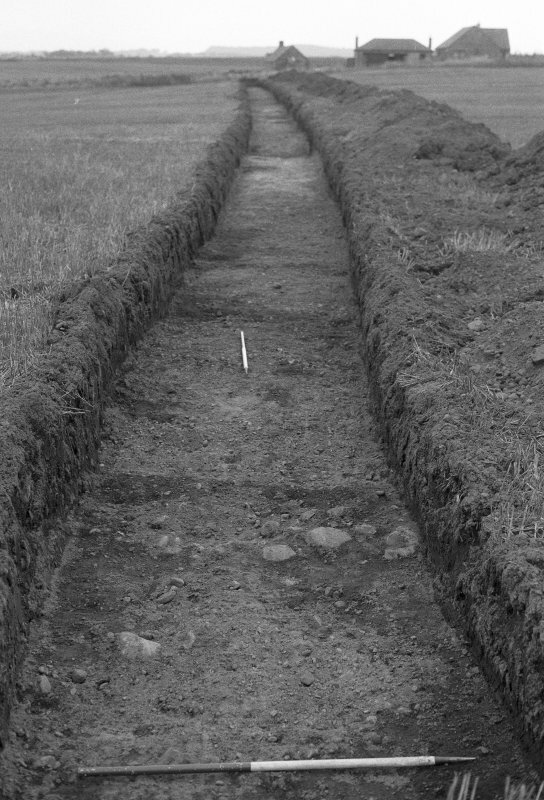 Trench A 1002. 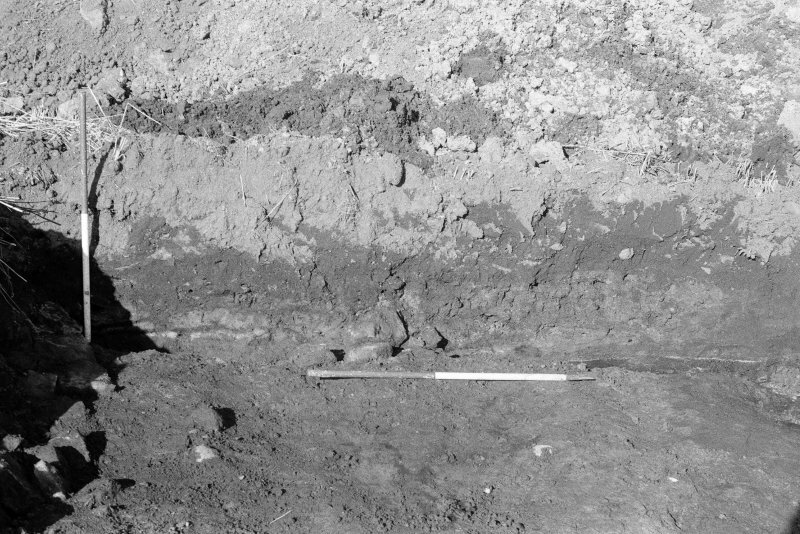 Slide 1/26. 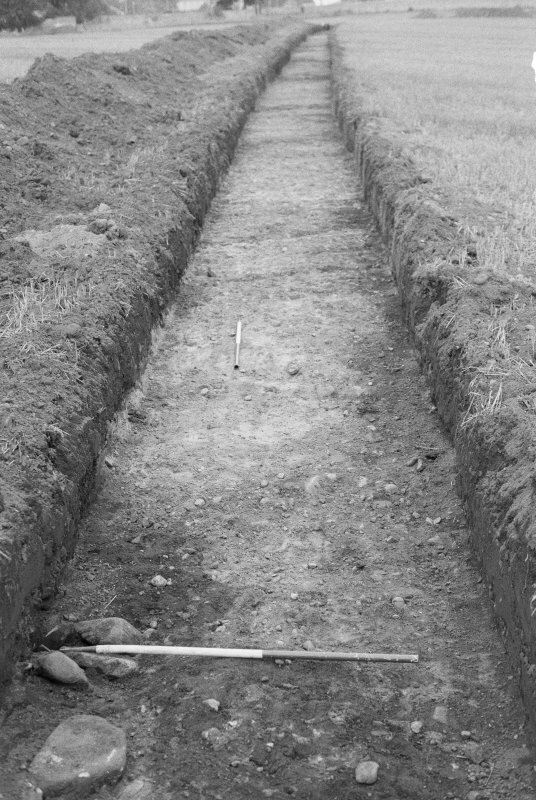 Trench A 1002. 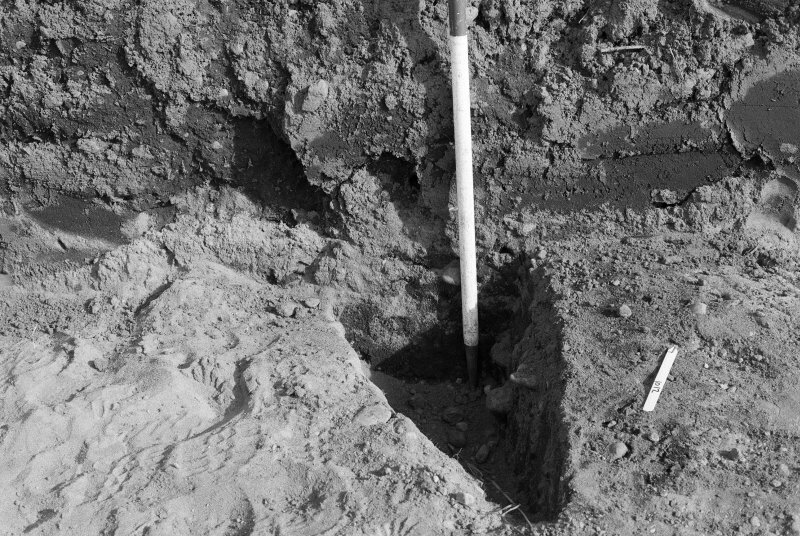 For possible enclosure (NJ 223 694), see NJ26NW 49. 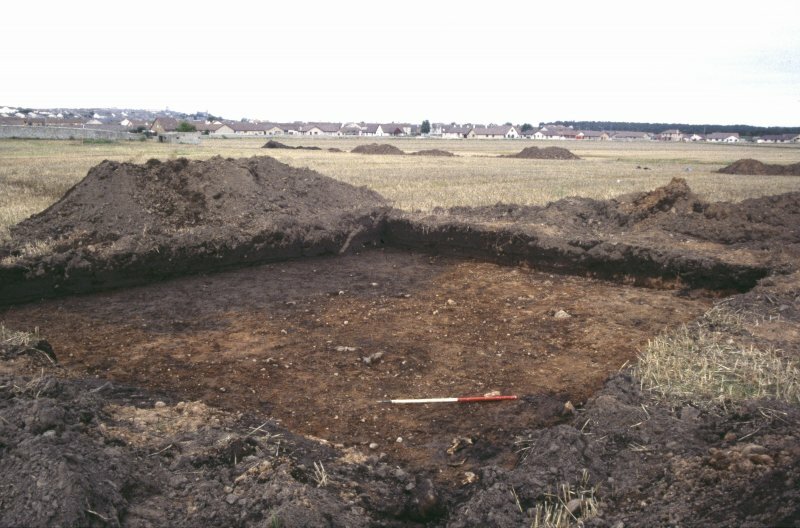 Bishop Richard (1187-1203) is known to have resided at Kinnedar, and in AD 1280, Bishop Archibald extended or rebuilt this stronghold or castle. 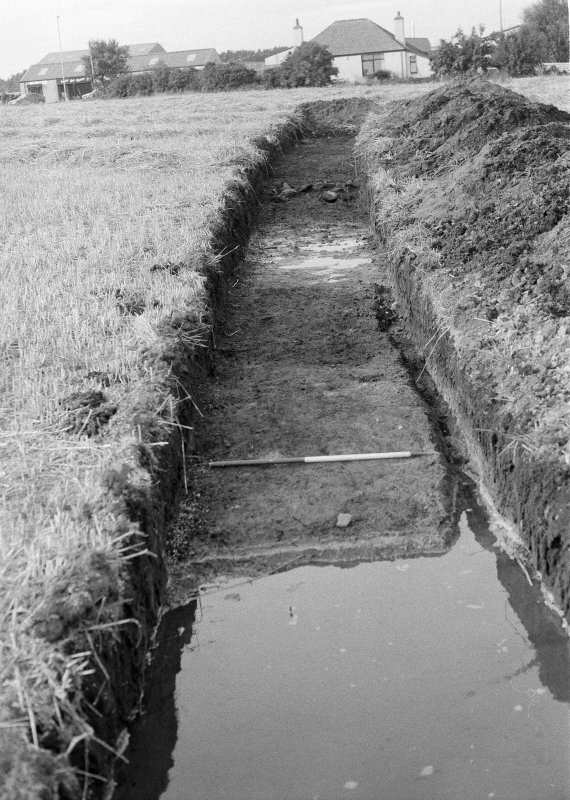 The foundations of the house and of the enclosure wall were seen by Pococke. 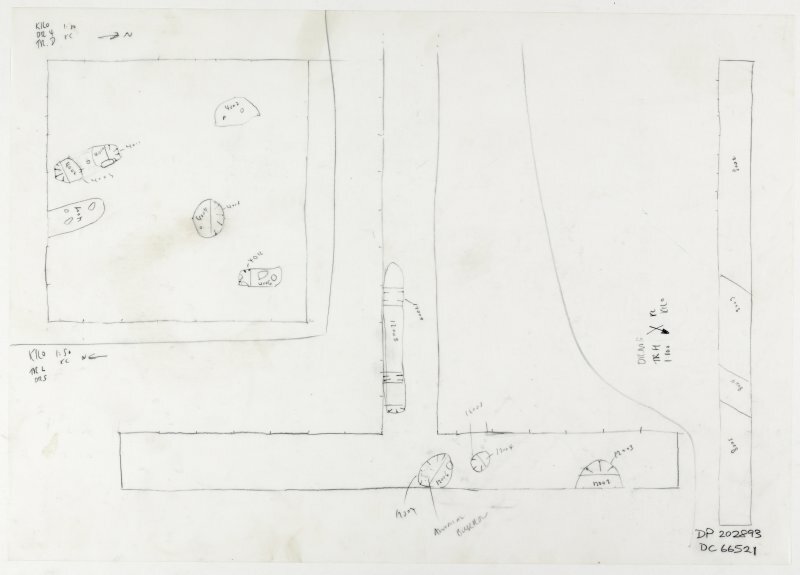 R Pococke 1760; H B Mackintosh 1924. 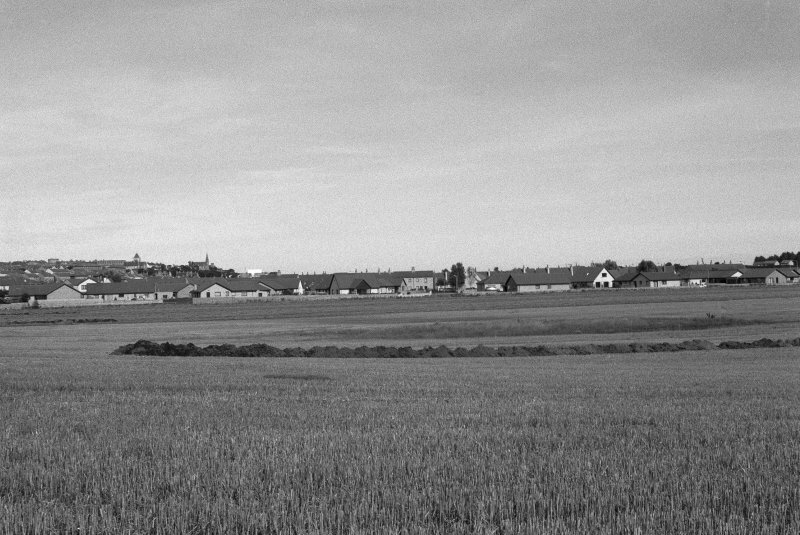 The stronghold of Kinnedar, called the Castle, now dignified by the name Bishop's Palace, in 1734 had its foundations and fortifications so entire as to be easily traced. 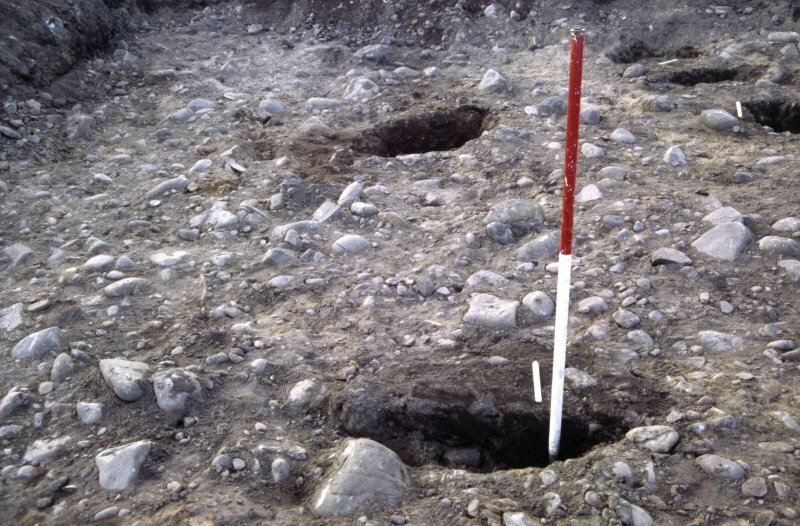 The whole covered about two acres in a hexagonal shape In the centre was the great tower which was later used as a bell tower for the adjoining church (NJ26NW 2) The tower was defended by two walls, 50 paces apart, each having a ditch in front, and, uncommonly, an earth rampart 8 - 10ft wide and high behind. 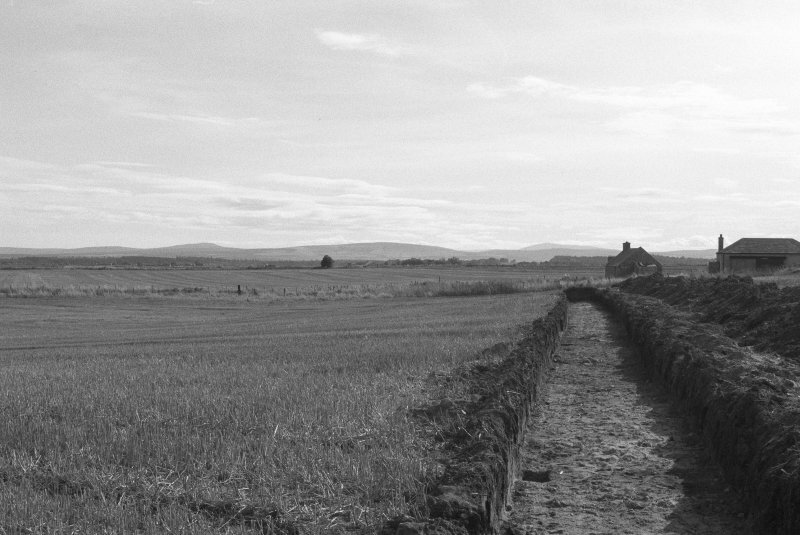 The outer wall had a square tower, projecting 6ft, at each angle. 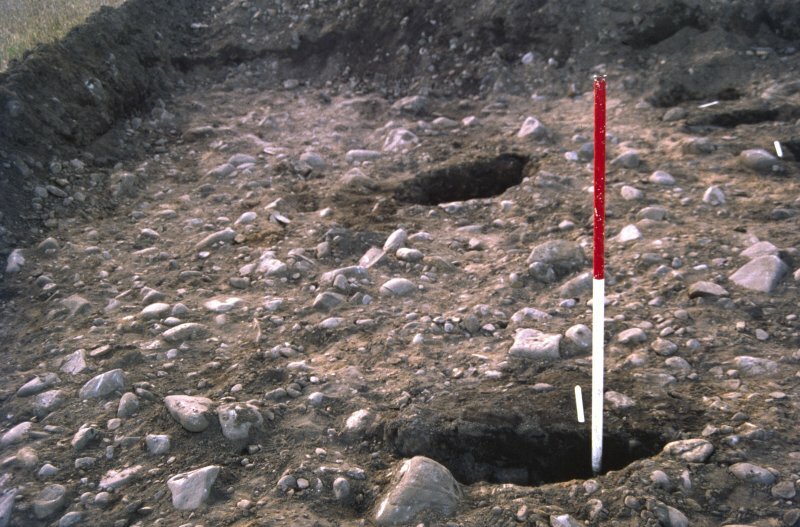 Directly to the east of the great tower were the vaulted storehouses and barracks. 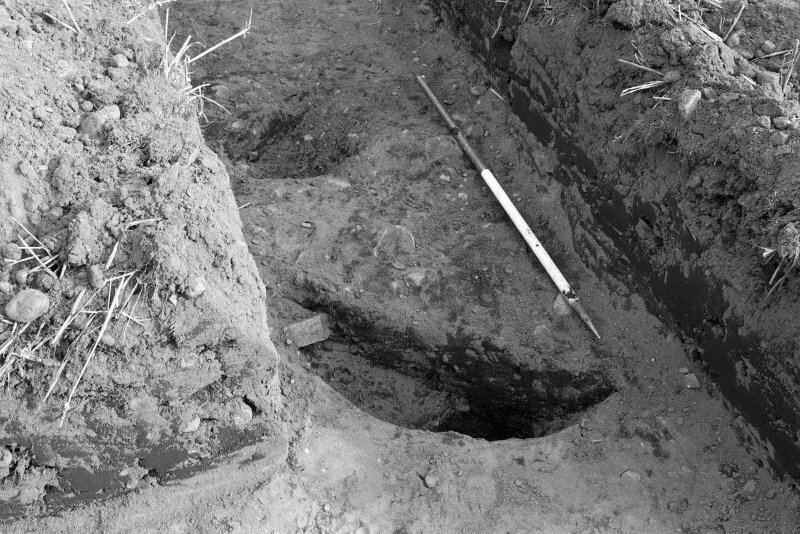 The outer wall on the east was 6ft thick and 16ft high; from it there was a sallyport. 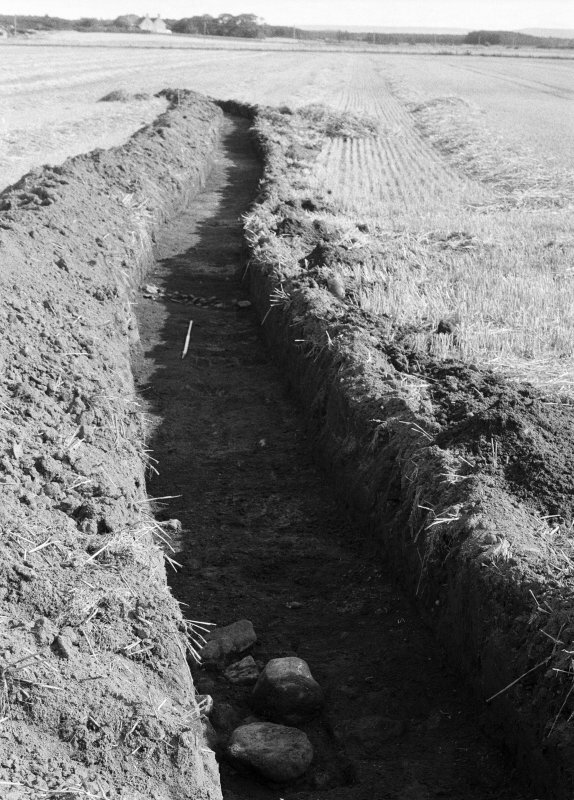 The fortification was further defended on the east by a morass and two ditches - the inner 24ft and the outer 12ft wide. 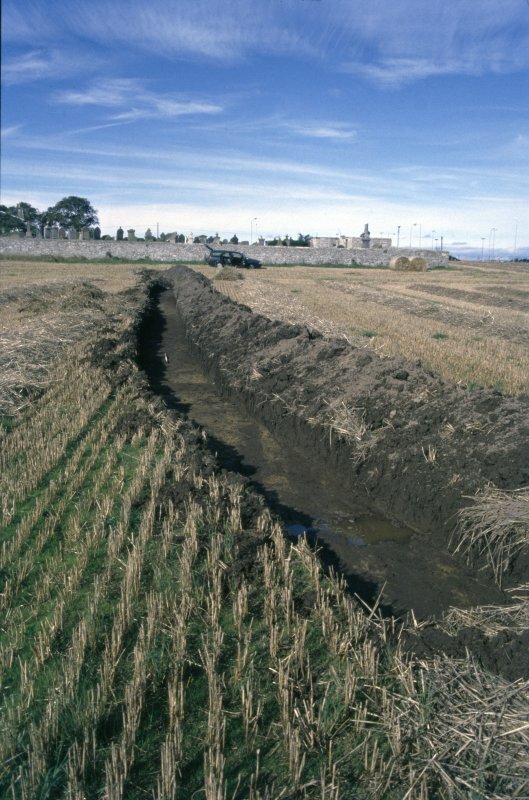 To defend these ditches was a horn-work, a hollow tower, which was converted to a pigeon-house by the bishops. 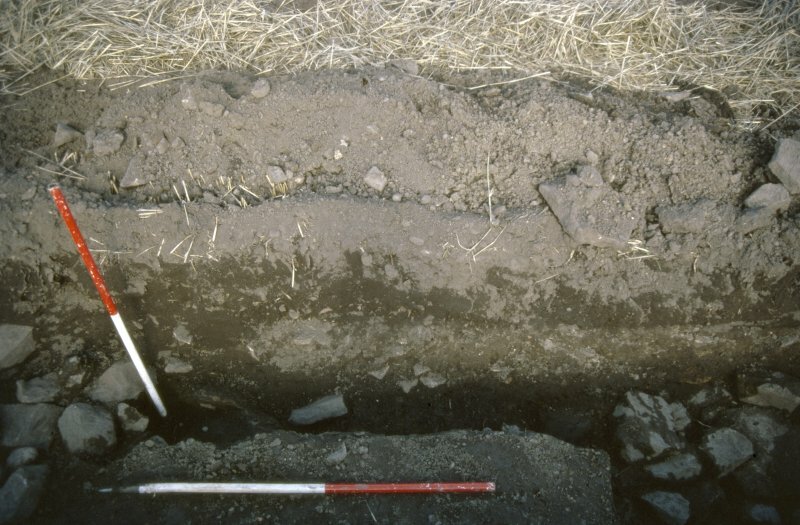 Since then, the levelling of the walls and the filling of the ditches with the ramparts, has revealed an astonishing quantity of ashes, oak-charcoal, broken urns and human bones - more especially under the foundations of the earthern ramparts. 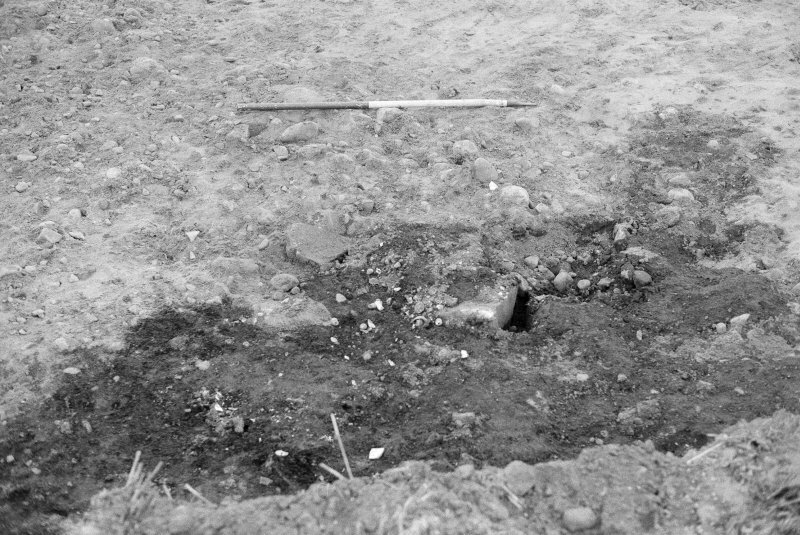 Under them were found closely packed graves covered with pet or turf ashes. 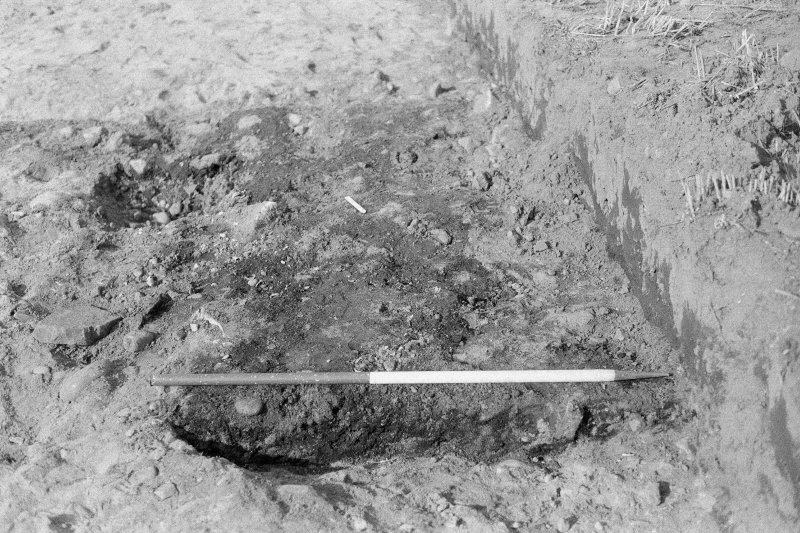 The stone cists were scorched and blackened with the fire by which the bodies had been burnt; within them were fragments of human bones and oak-charcoal. 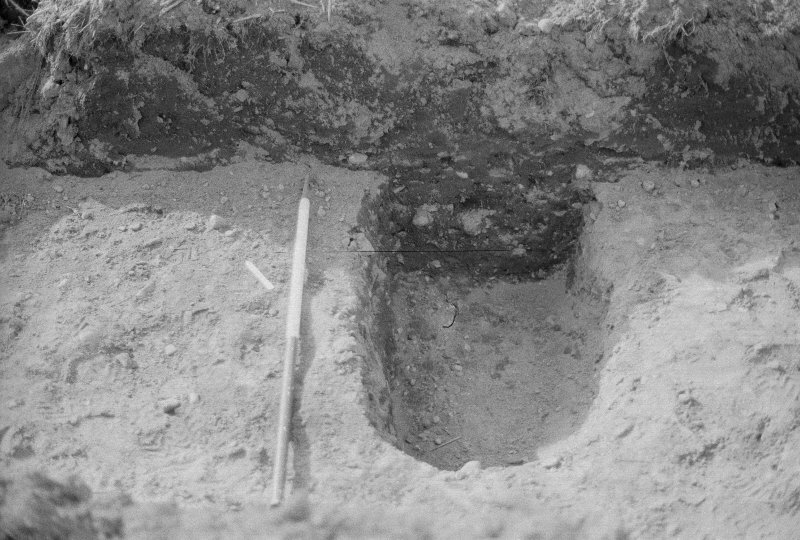 L Shaw 1734; NSA 1845. 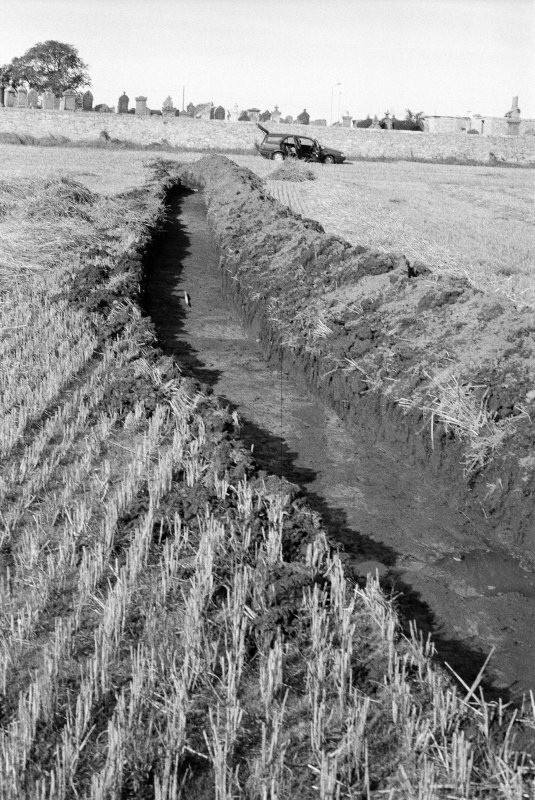 Ditches and mound seen on RAF air photographs (82/RAF/955 F21: 0027-9). 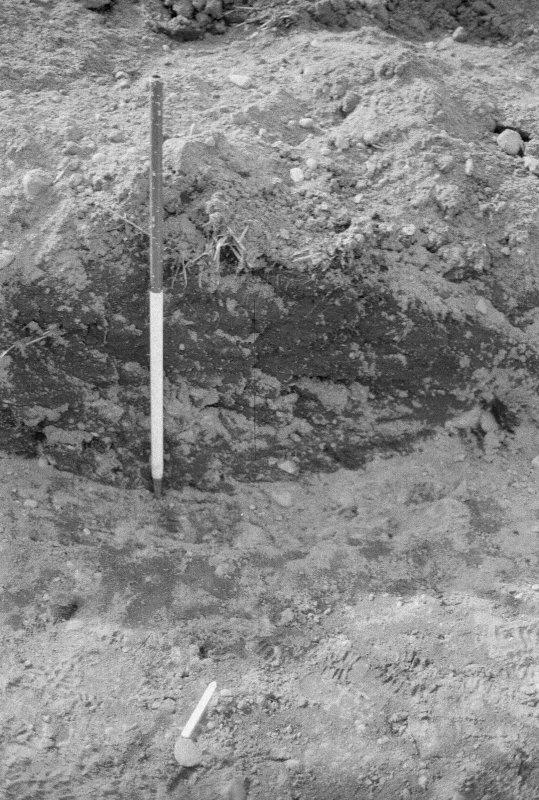 No intelligible remains can be seen on the ground to correspond with the crop-mark on air photographs. 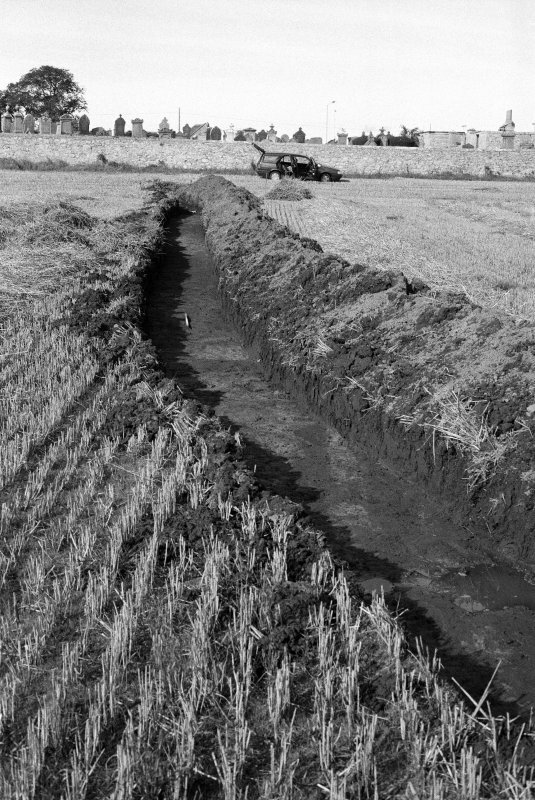 Any ramparts and ditches which existed at the site have been ploughed out or filled in. 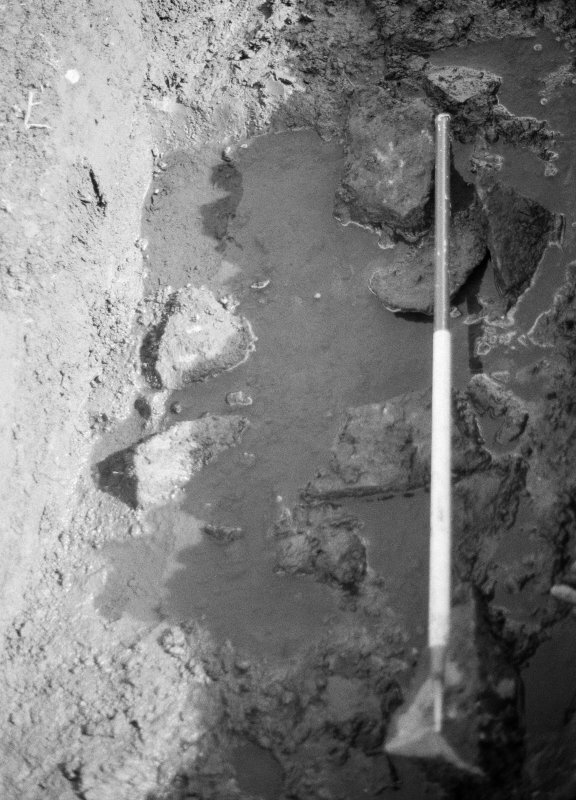 At NJ 2243 6969, is a small stone structure 2.0m. 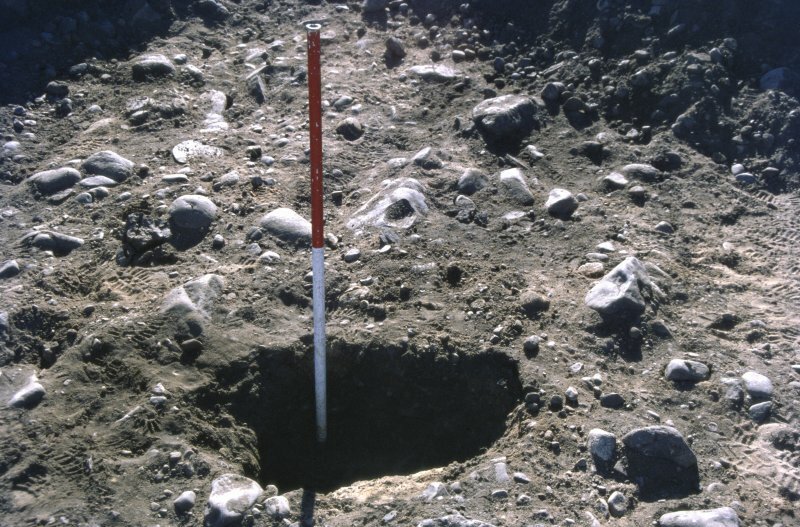 square and 0.9m high, filled with loose stones and capped by a pyramid of mortared stone, giving the structure a total height of 1.6m. 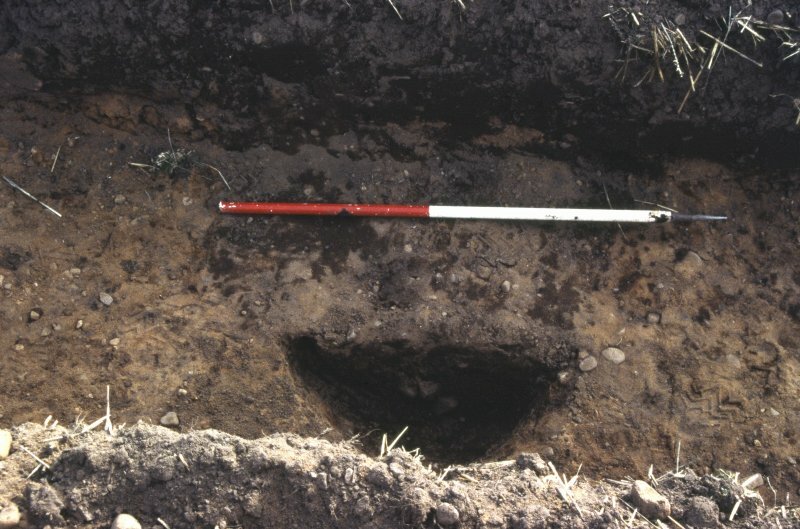 This feature may be the remains of the hollow tower, later converted to a dovecot, as mentioned by NSA 1845. 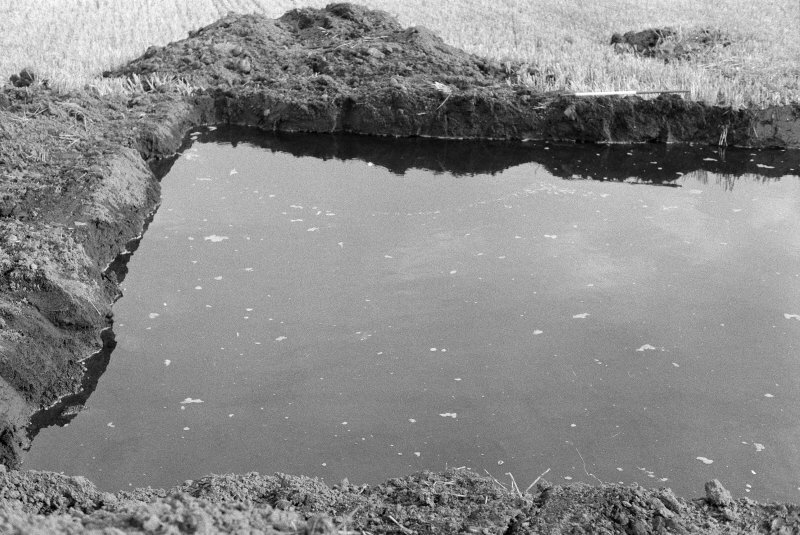 Visited by OS (WDJ) 27 November 1962. 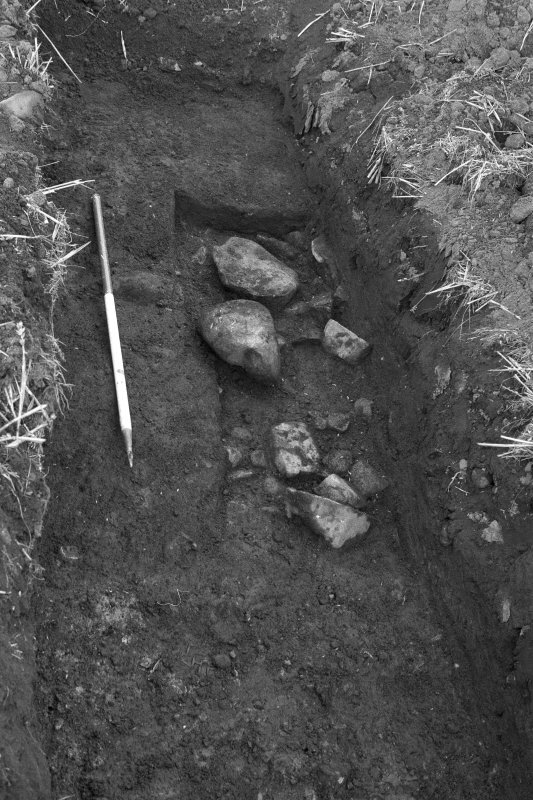 All that remains today is a squat block of stones and concrete on the edge of the field. 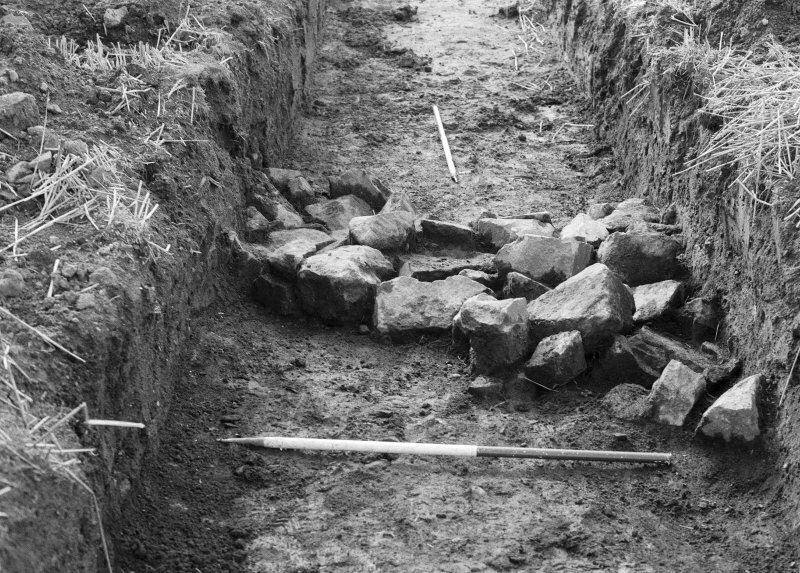 This is not part of Kinneddar Castle but is simply a reminder that the castle stood nearby. 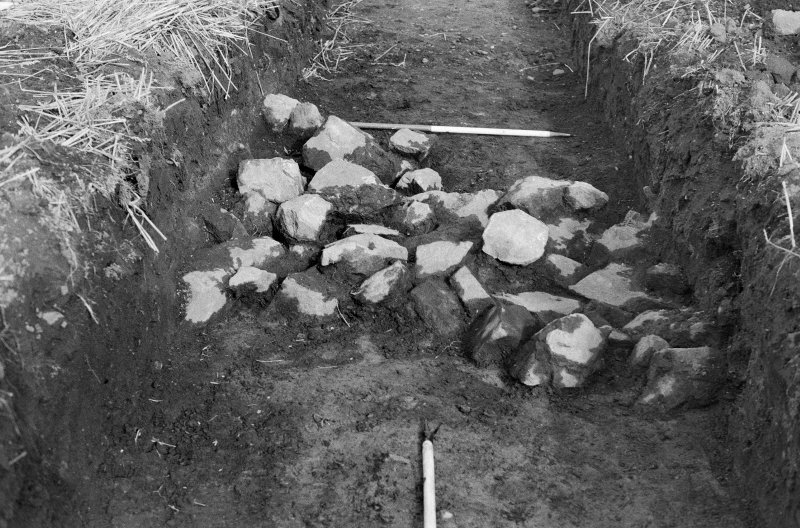 In 1936 boys from Gordonstoun School led by a master excavated the foundations of Kinneddar Castle. 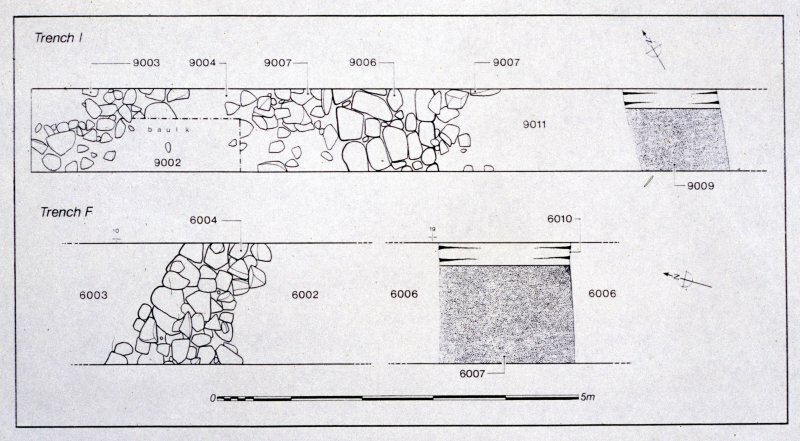 They followed the description given in NSA and found the foundation stones of the great tower, the walls and the small outer towers as described. 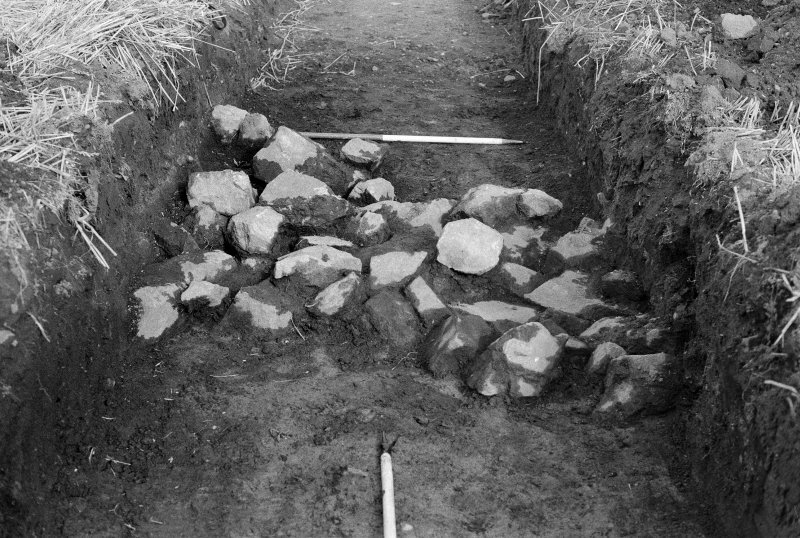 NJ 224 696 Research carried out since 1989 as part of the Scottish Episcopal Palaces project has shown that apart from its importance as a probable Dark Age monastic site, Kinneddar is the site of an early stone castle and cathedral. 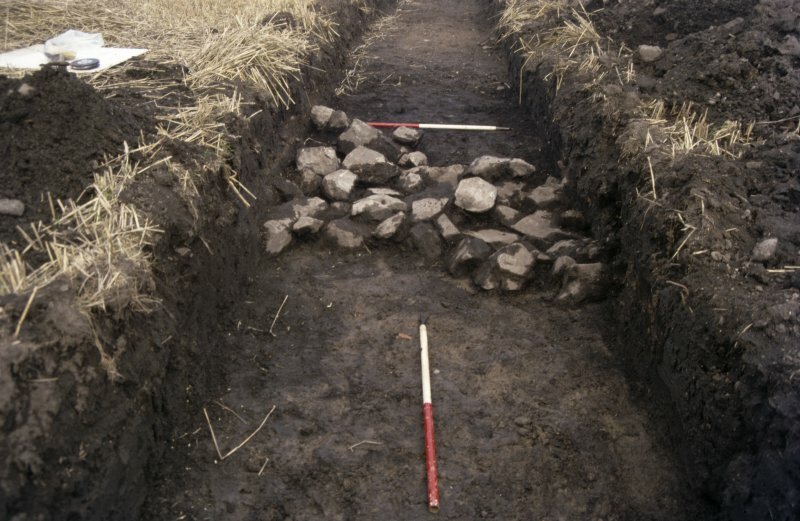 Documentary sources showed that Bishop Richard of Moray (1187-1203) resided at Kinneddar, and that what was later to become Kinneddar parish kirk briefly served during his episcopate as the cathedral church of the diocese. 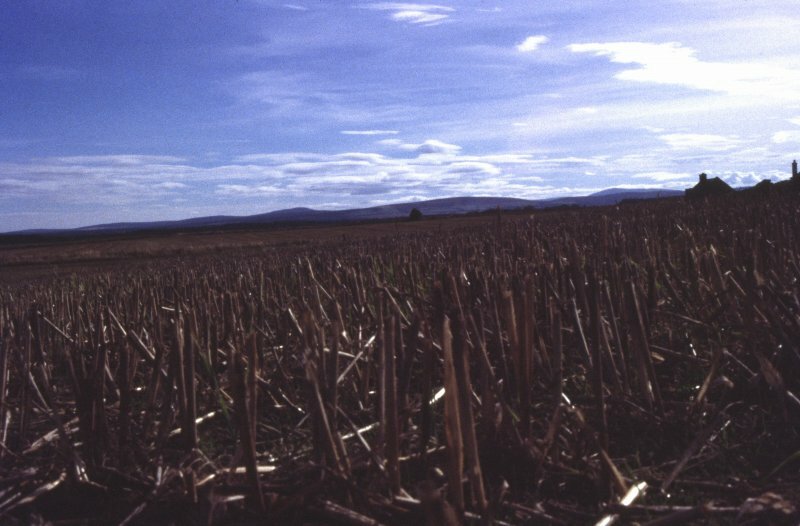 Early in the 13th century, the cathedral was moved first to Spynie and later to Elgin. 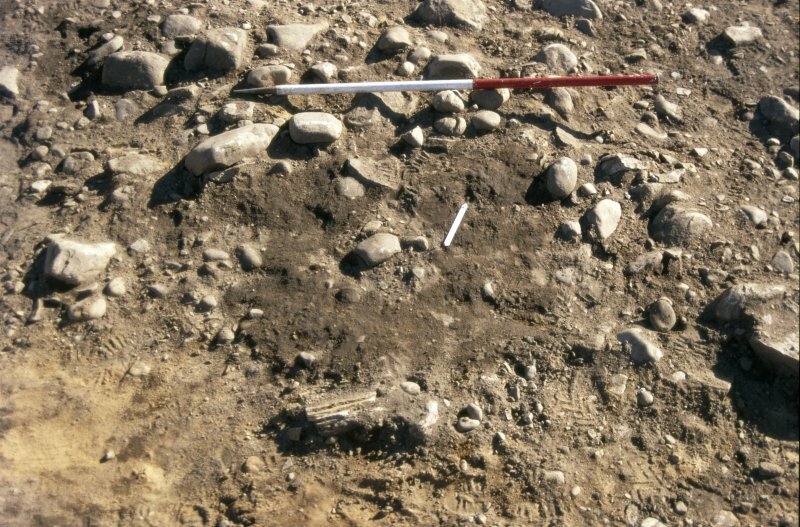 Despite this, sources also indicated that the castle was enlarged or rebuilt by Bishop Archibald in c1280. 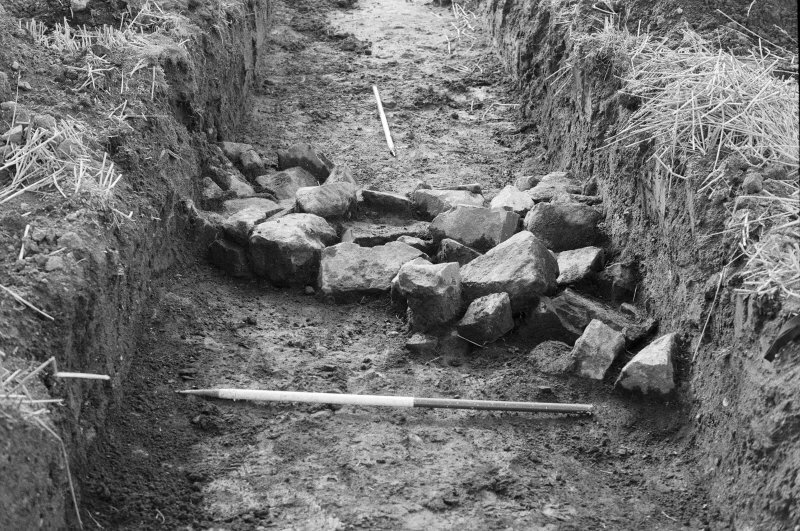 It appears that the Bishop's Palace at Kinneddar remained in use until the later 14th century, but it was ruinous by the 17th century. 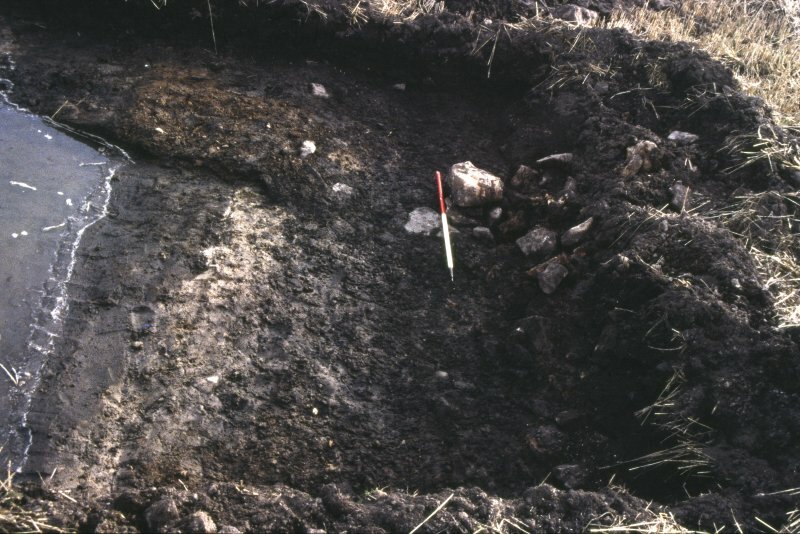 A detailed 19th century account of the site suggests that the castle was almost certainly unique in a Scottish context; it seems to have been a concentric castle. 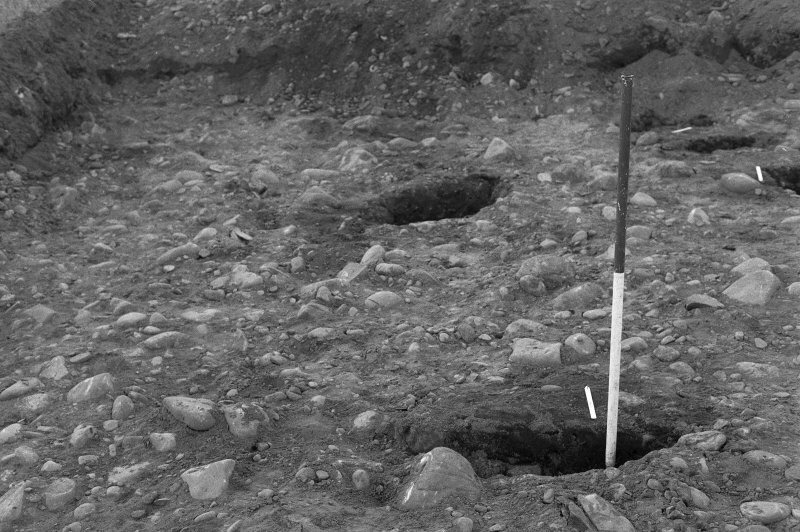 It was hexagonal in shape. 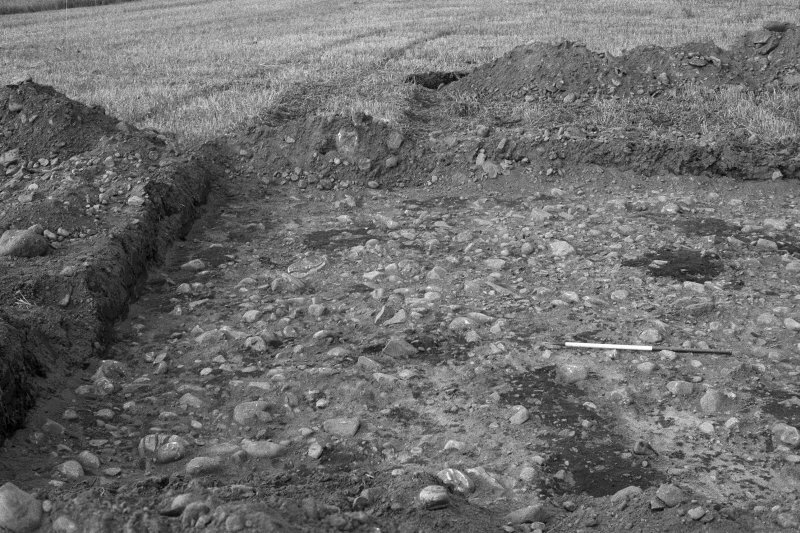 It seems to have been levelled during the 19th century. 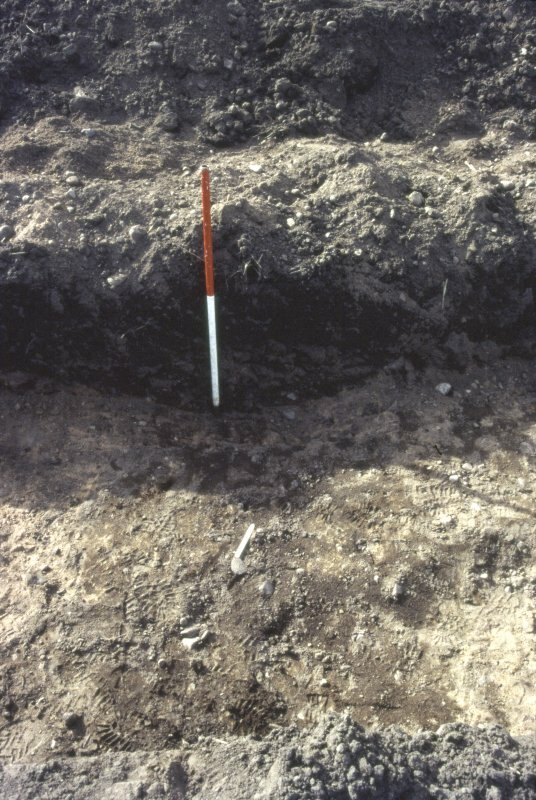 In 1988 a resistivity survey immediately N of the cemetery at Kinneddar located the site of the Bishop's palace. 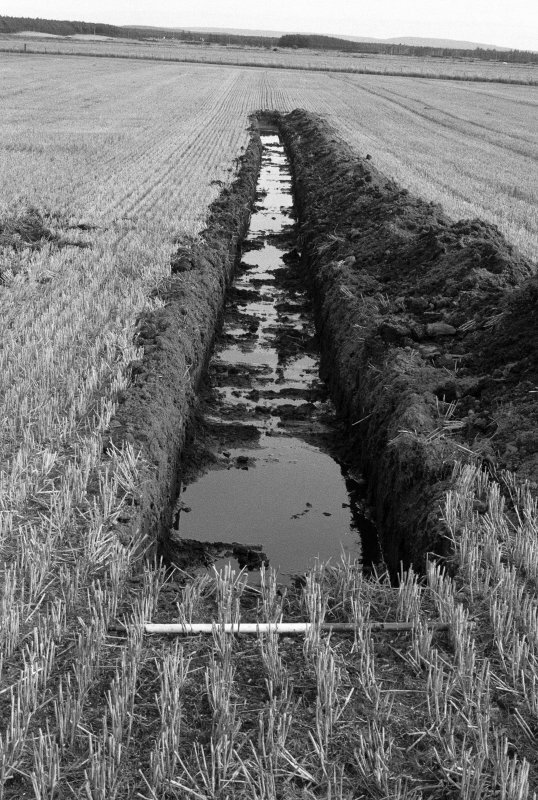 Twelve grids 20m by 20m were laid out, within which the presence of walls and ditches were detected. 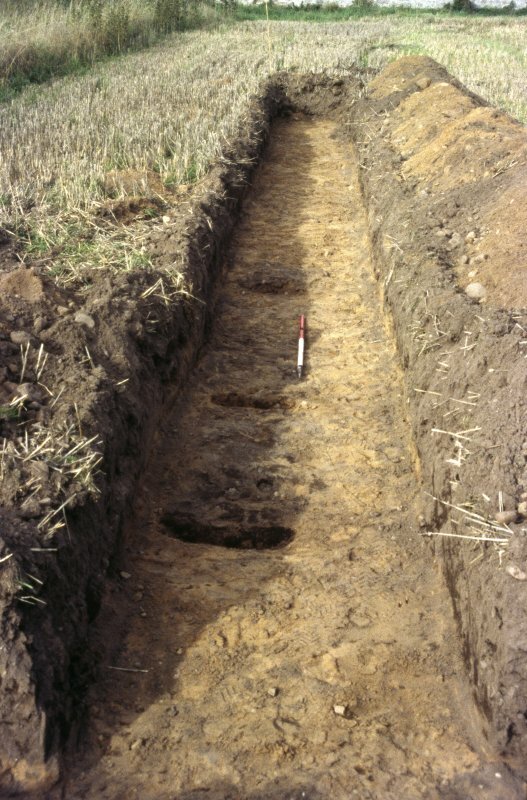 High resistance linear features indicate walls oriented roughly N-S and E-W. 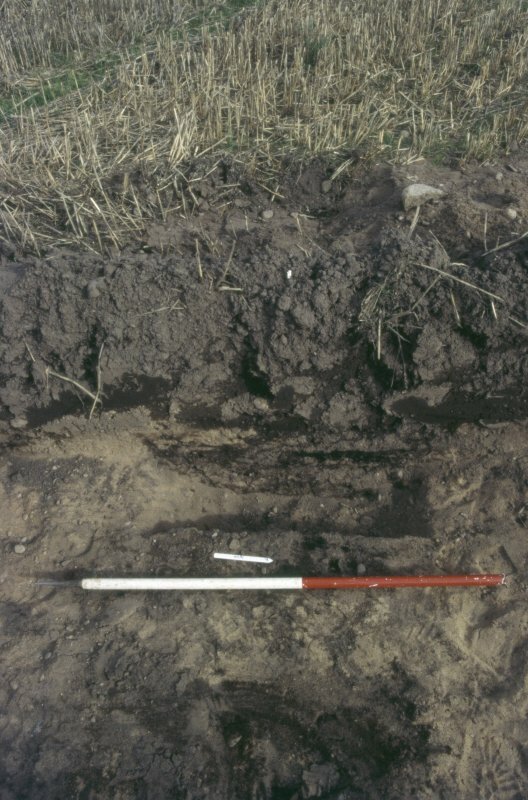 These seem to correspond with the sides of a hexagon, the linear low resistance features corresponding with ditches. 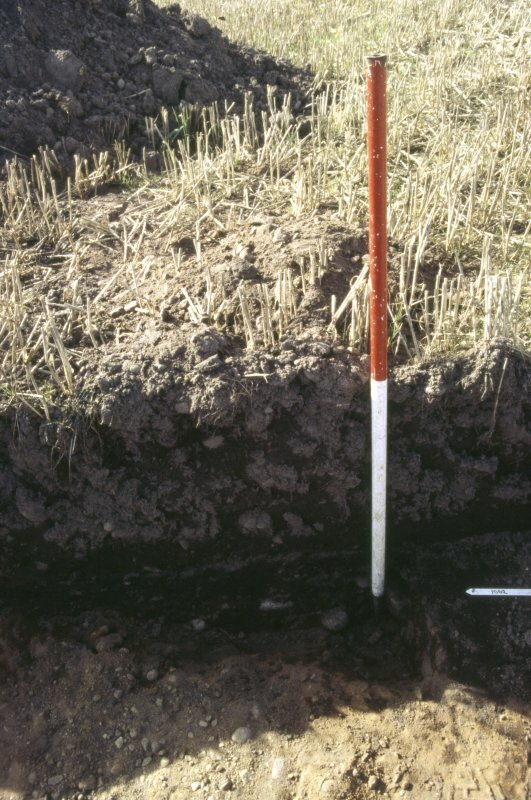 An area of high resistance in the centre of a site should almost certainly be associated with the 'great tower'. 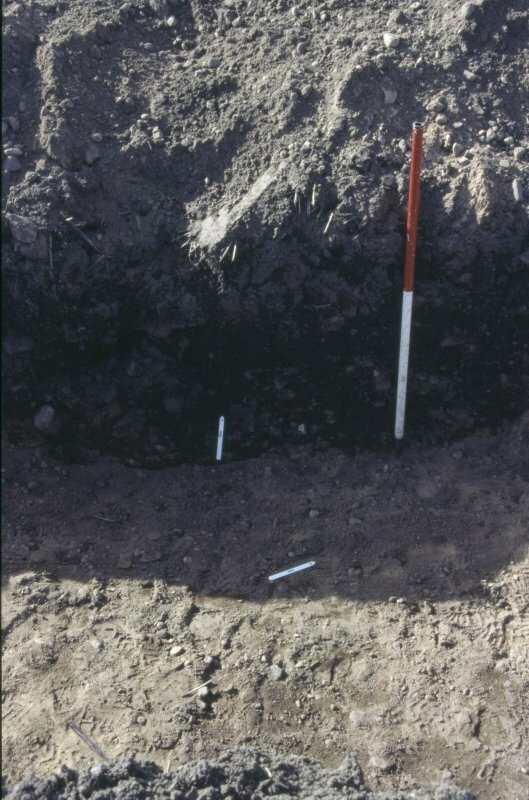 In 1995 a further resistivity survey of six 20m by 20m grids was undertaken within the cemetery. 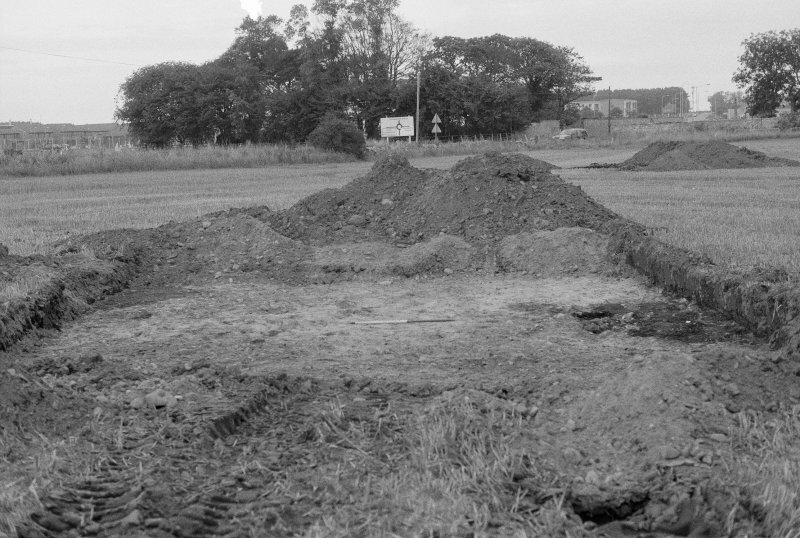 The site of the former parish church was identified under a prominent mound covered with graves. 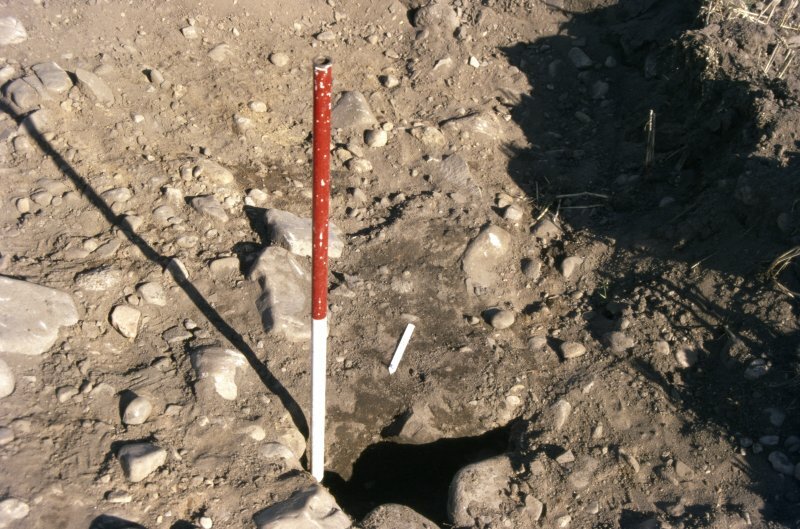 In this case the cruciform church was represented by areas of low resistance, suggesting that the walls have been heavily robbed. 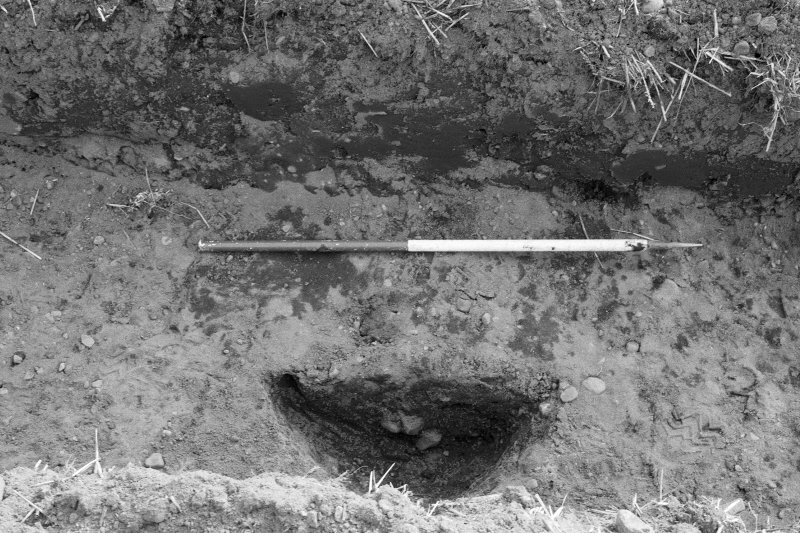 It seems likely that this took place in the later 17th century when the parishes of Ogston and Kinneddar were combined, and a new parish church was erected at Drainie. 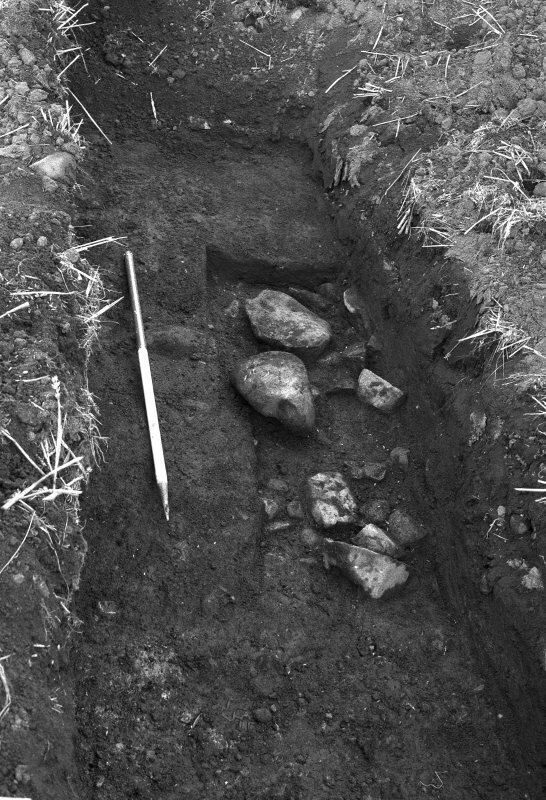 There is some evidence to suggest that this later church included reused stone from Kinneddar. 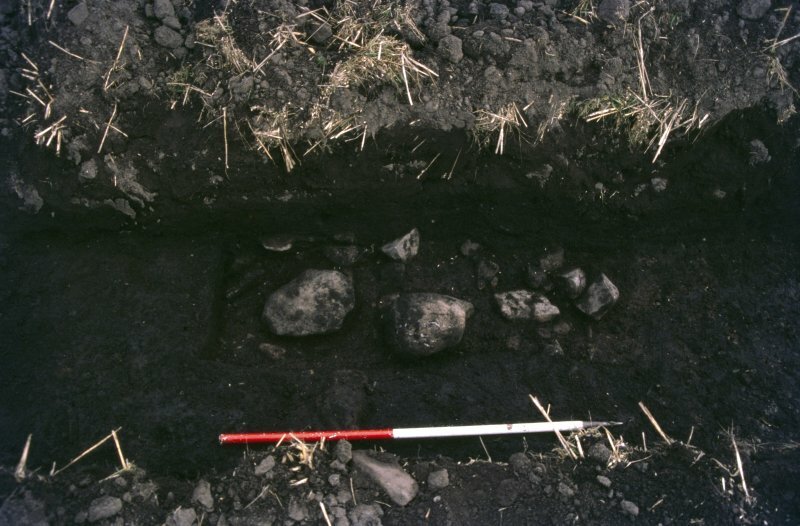 A large number of Pictish stones have been recovered from the Kinneddar area since 1855. 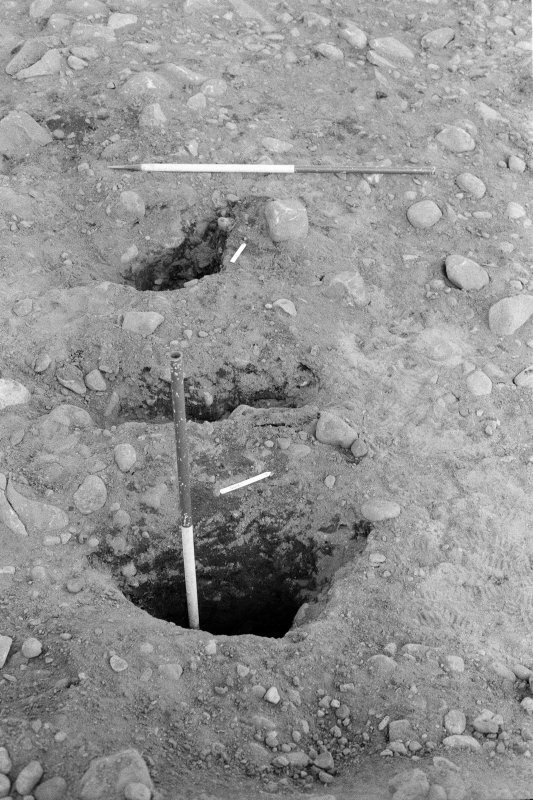 The presence of the pictish stones and the report in the New Statistical Account of a cist cemetery underneath the ramparts or ringwork indicate that Kinneddar is a multi-period site. 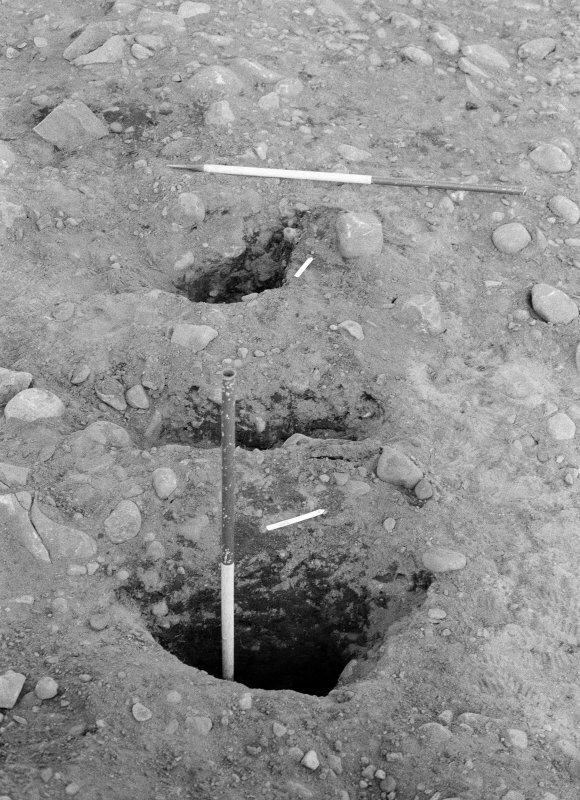 The majority of the Pictish stones may be assigned to Class III. 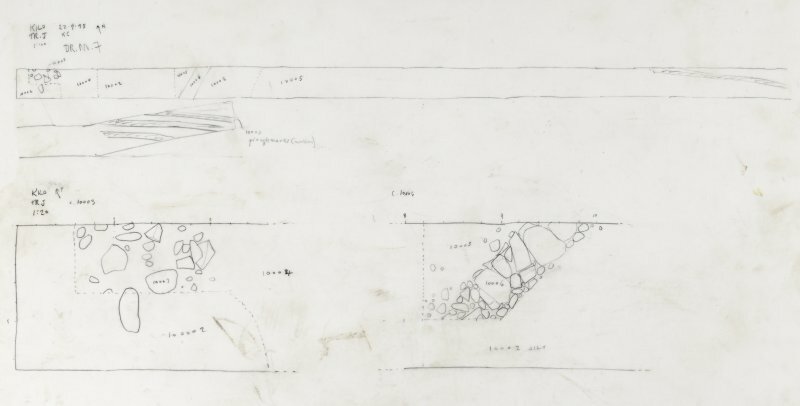 They include a fragment which is closely related to the long panel of the St Andrews sarcophagus, depicting David rending the jaws of a lion (see Fig 12). 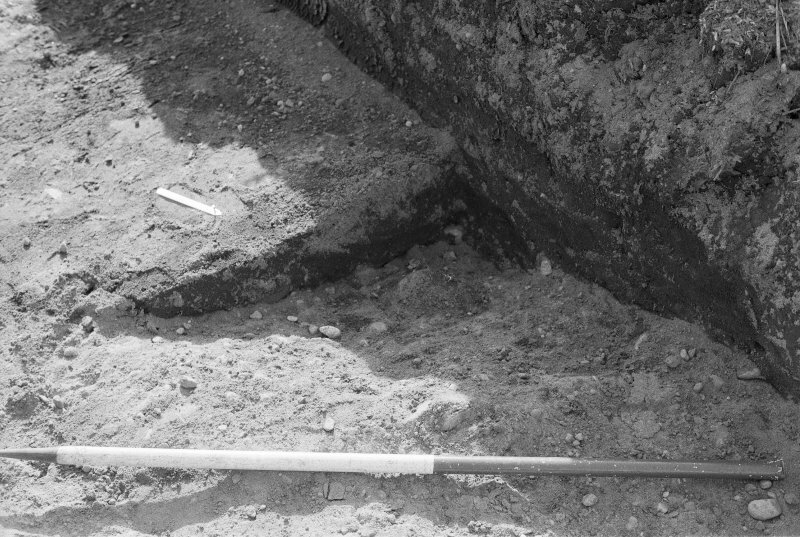 Sponsors: British Academy, University of Wales, Lampeter and the Scottish Castle Survey. 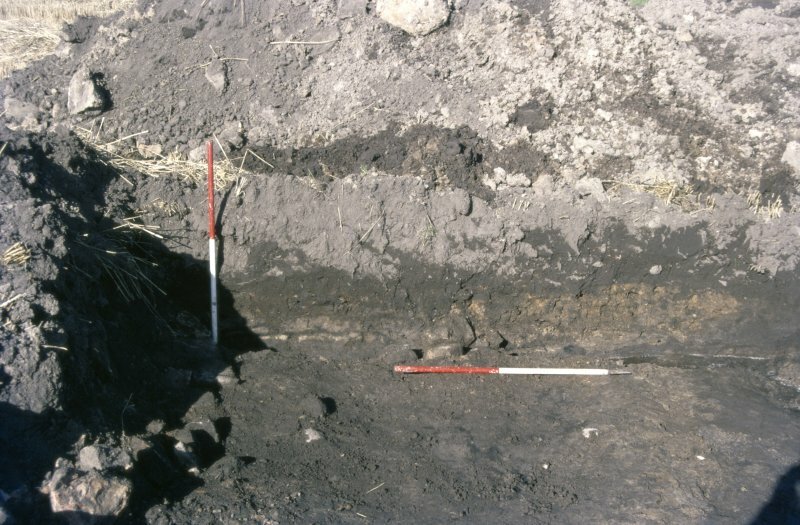 A Aspinall, N Q Bogdan and P Z Dransart 1995. 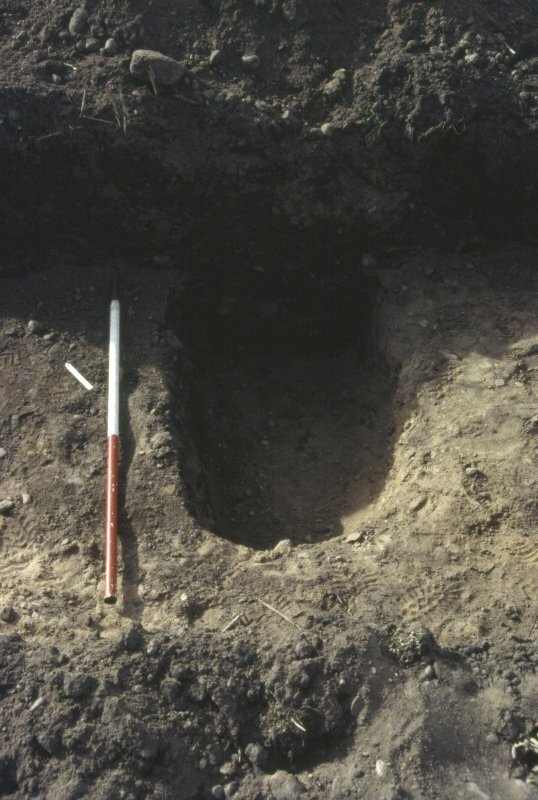 (Cited as GRC/AAS NJ26NW 2). 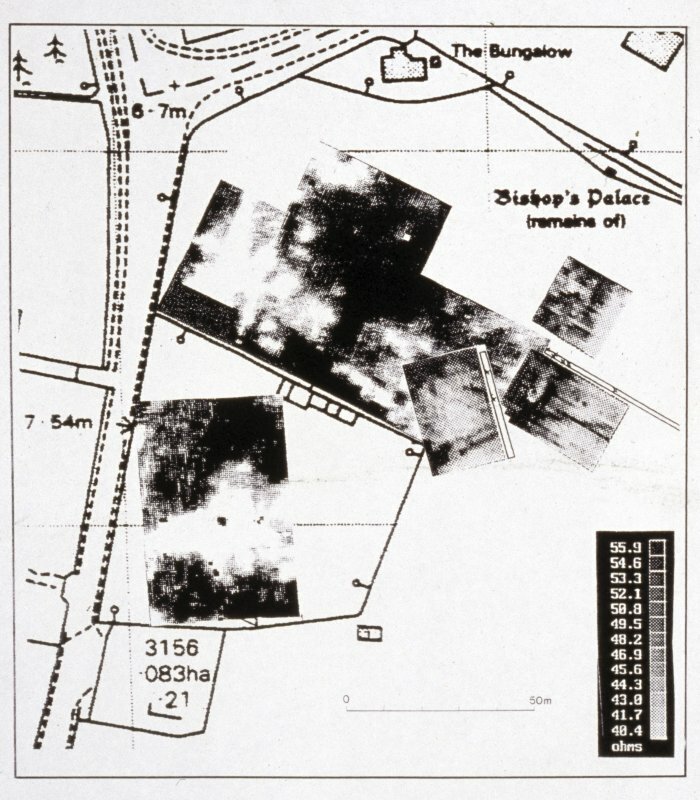 Air photographs: AAS/94/14/G27/10-12. 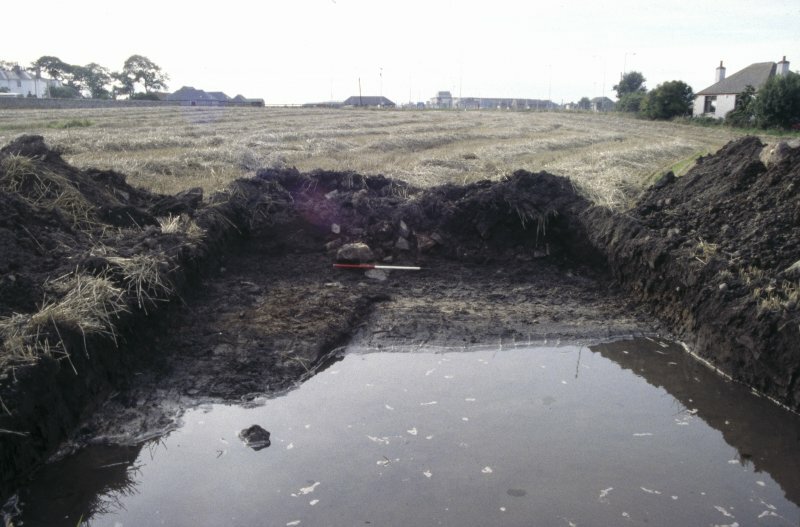 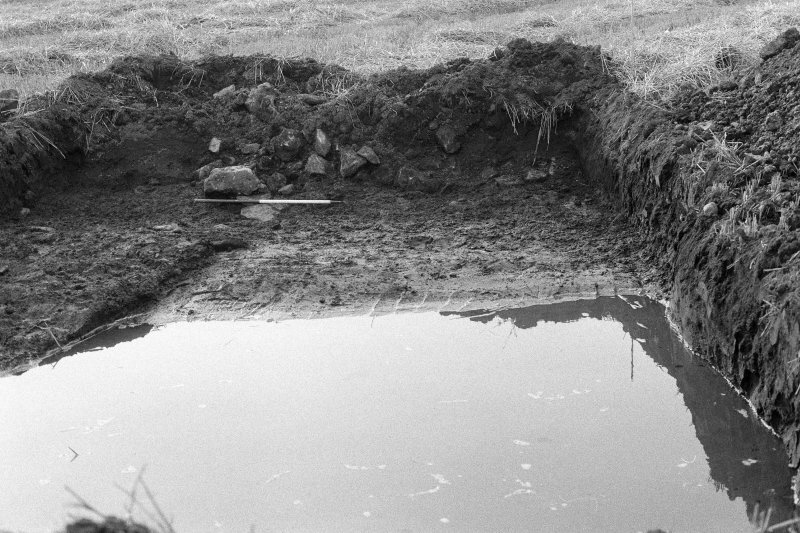 Excavation (location cited as NJ 2243 6969) was carried out by EUCFA in September 1995 to investigate features recorded as cropmarks on (unreferenced) air photographs and as anomalies in geophysical survey (carried out by A Aspinall in 1992); geomorphological coring was also carried out. 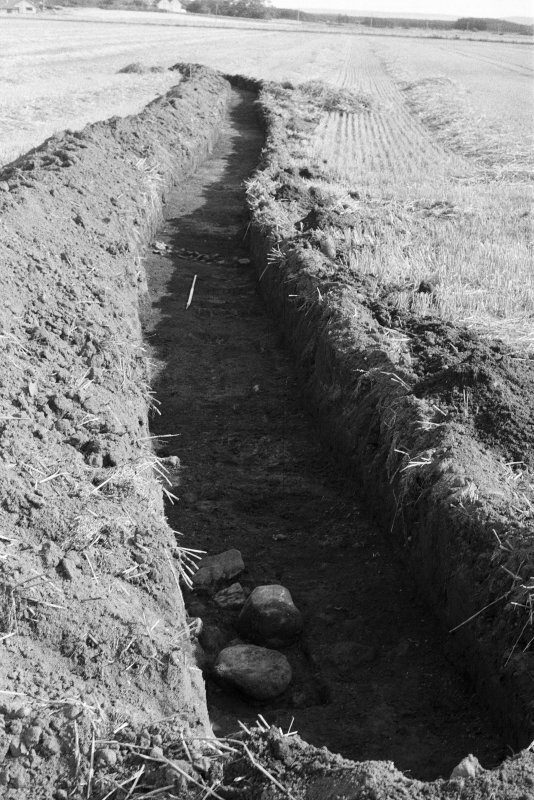 Twelve trenches were laid out to examine an area of over 900 sq m (mostly to the N of the cemetery) in an attempt to locate Kinneddar Castle, the form of which may be perpetuated by the N and W sides of the field. 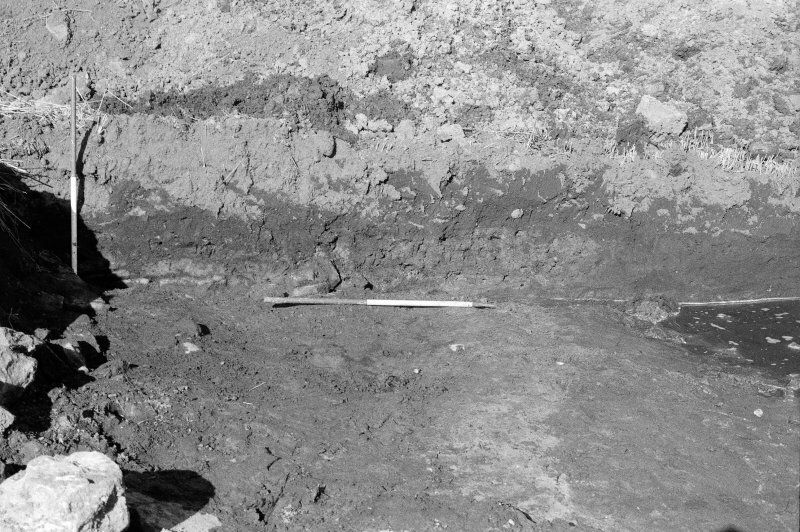 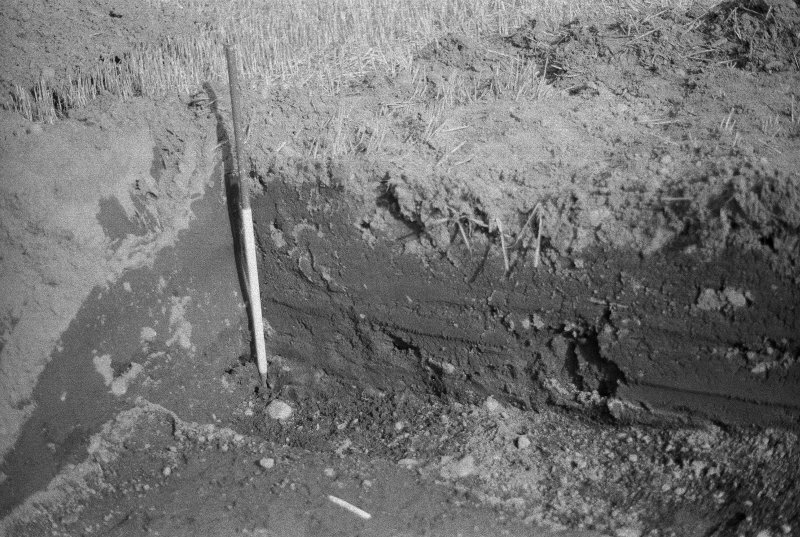 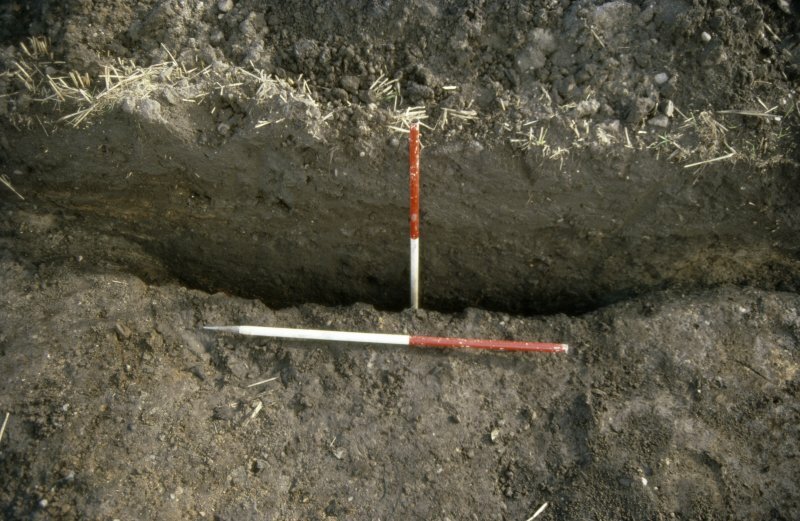 Excavation revealed shallow furrows (aligned E-W) of agricultural origin, pits (of uncertain origin) and natural features. 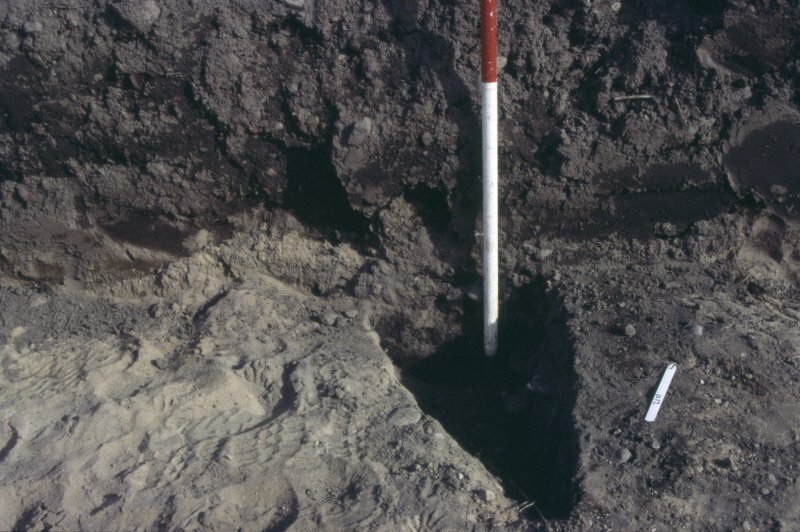 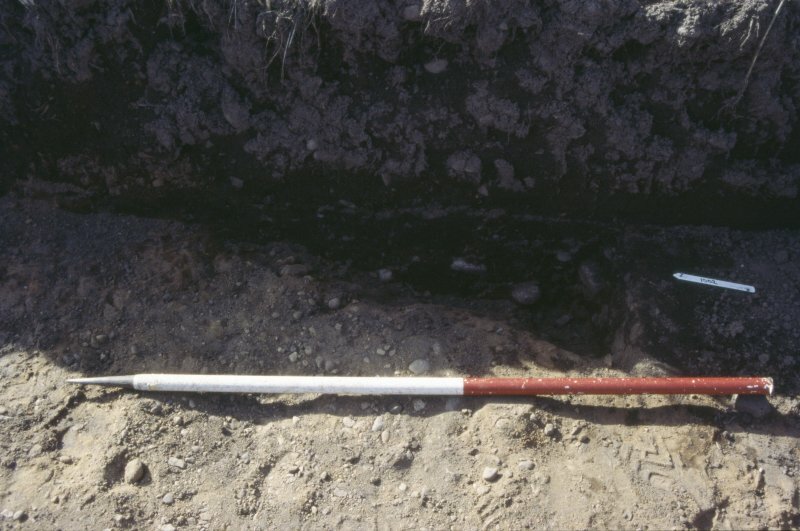 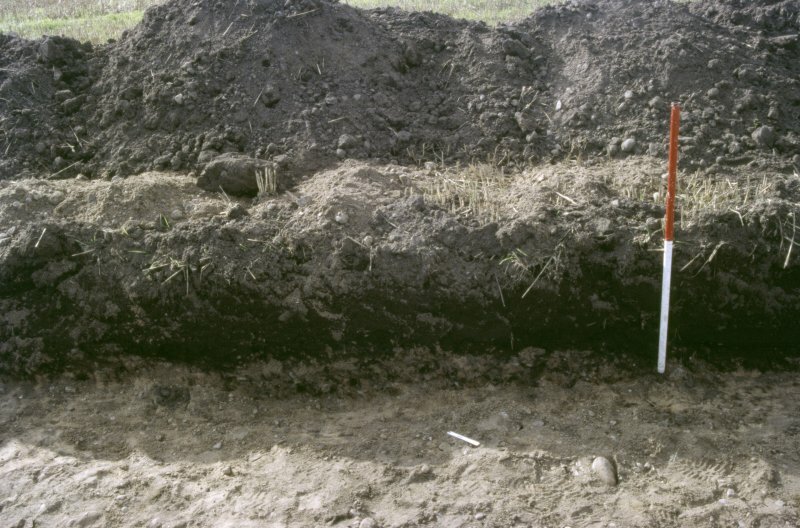 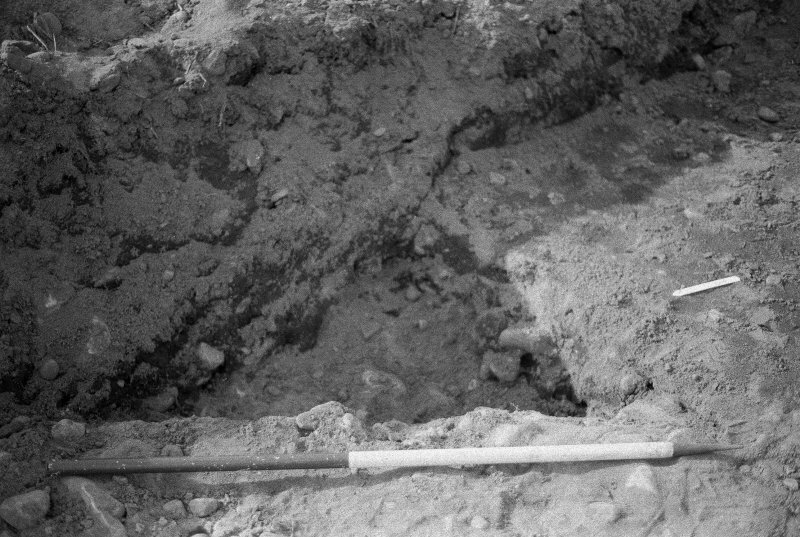 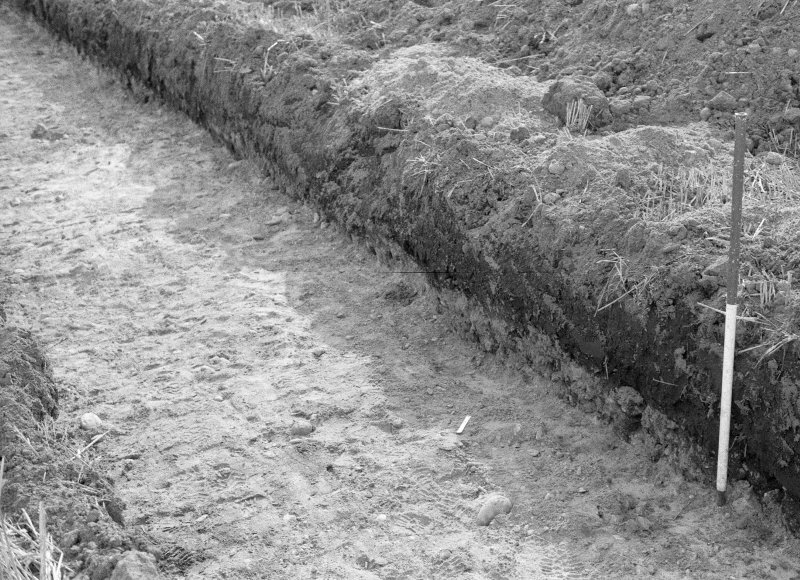 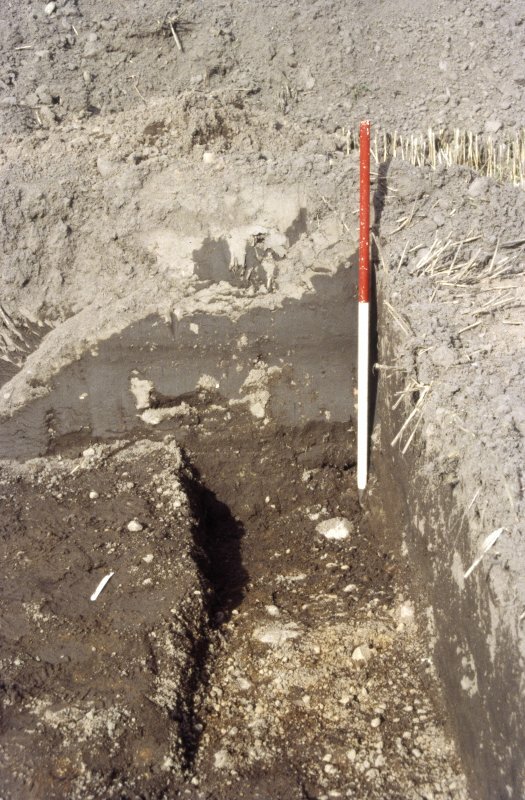 A U-profiled ditch with a silty fill (measuring about 2m wide and 0.5m deep) and the remains of a wall of large angular boulders were identified in trench F, to the N of the cemetery (NJ26NW 2); to the N of the wall there was a dump of silt, clay, charcoal and grit which contained large animal bones, iron fragments and medieval pottery. 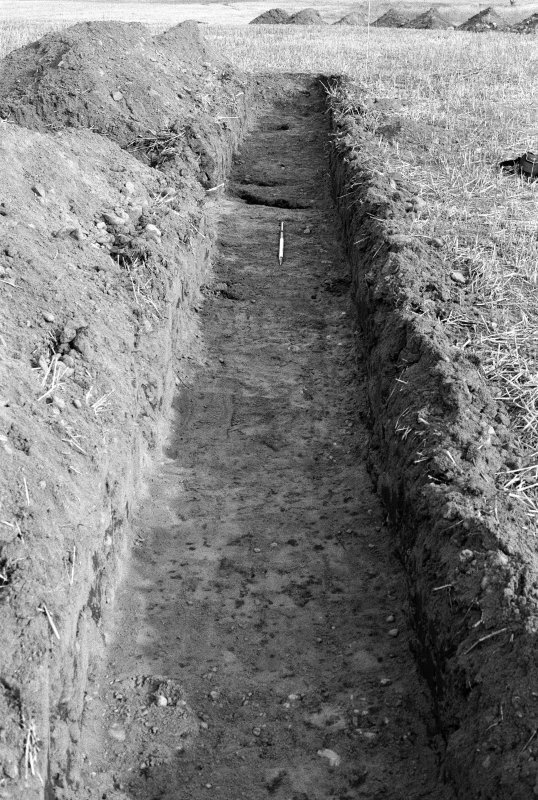 Trench G (to the N) revealed tumble from a wall to the W of the trench, and trench I (further to the E) revealed a substantial wall, further tumble and a possible U-shaped ditch. 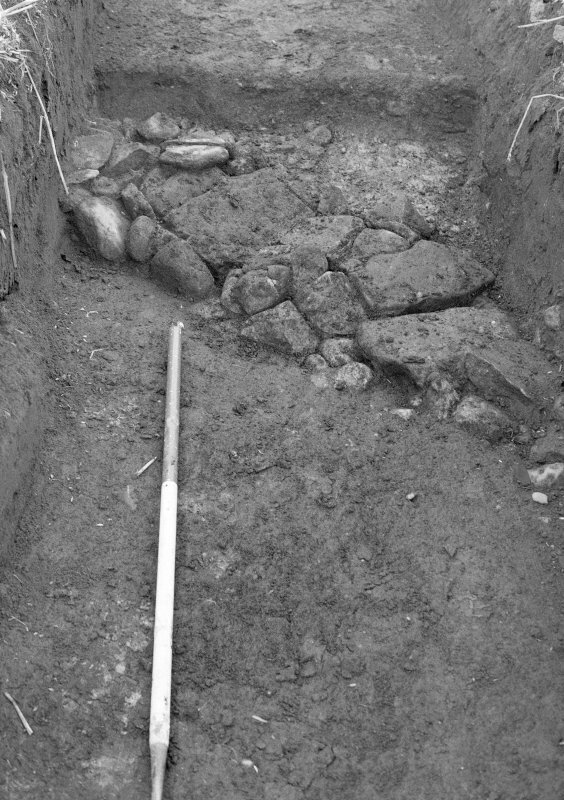 These latter features are interpreted as representing the ploughed-out remains of the hexagonally-shaped structure of the Bishop's Palace. 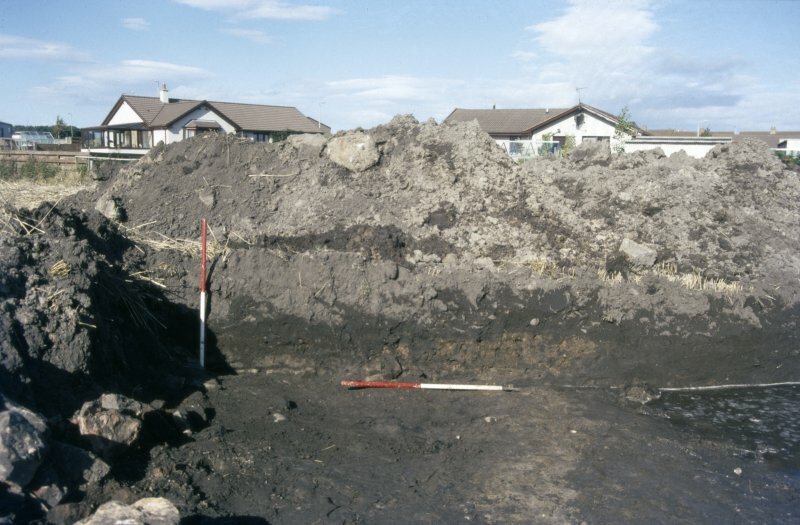 The excavation archive will be retained by Grampian Regional Council. 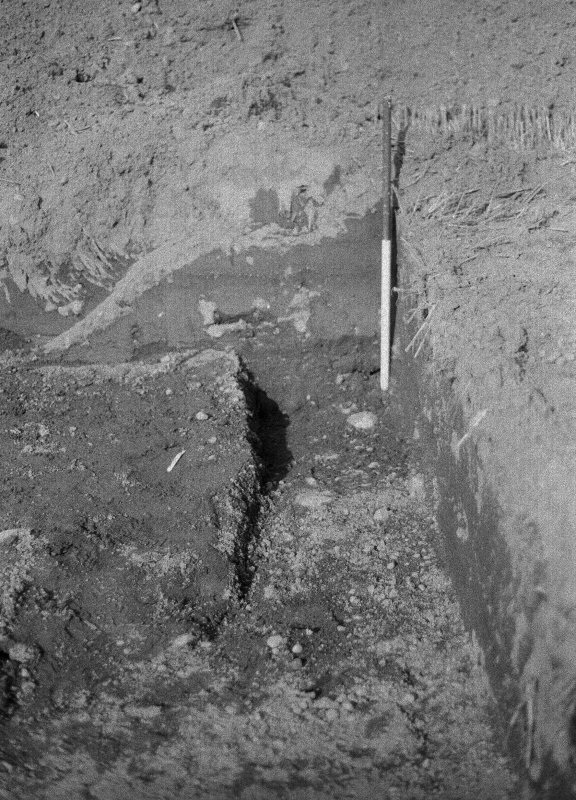 Information from K Cameron (Edinburgh University Centre for Field Archaeology), October 1995 (NMRS, MS/726/77). 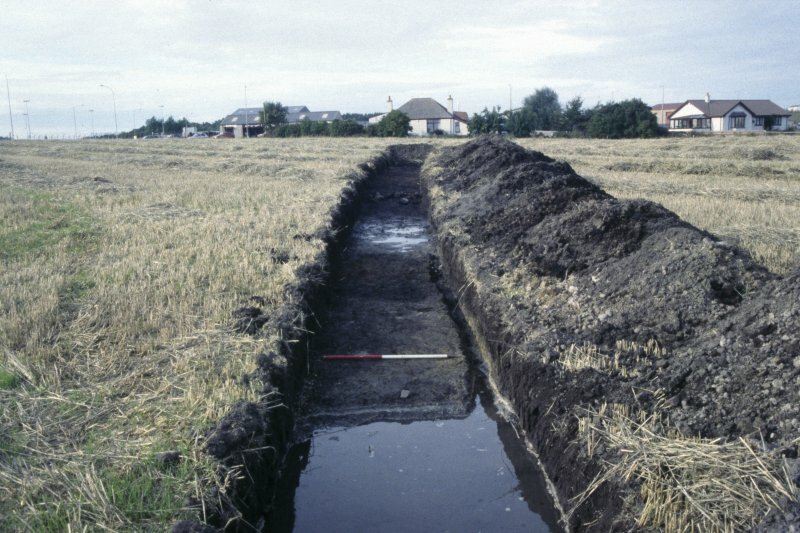 NJ 224 696 An evaluative excavation and geophysical survey were undertaken during September 1995 on the site of Kinneddar Castle (the Bishop's Palace) near Lossiemouth. 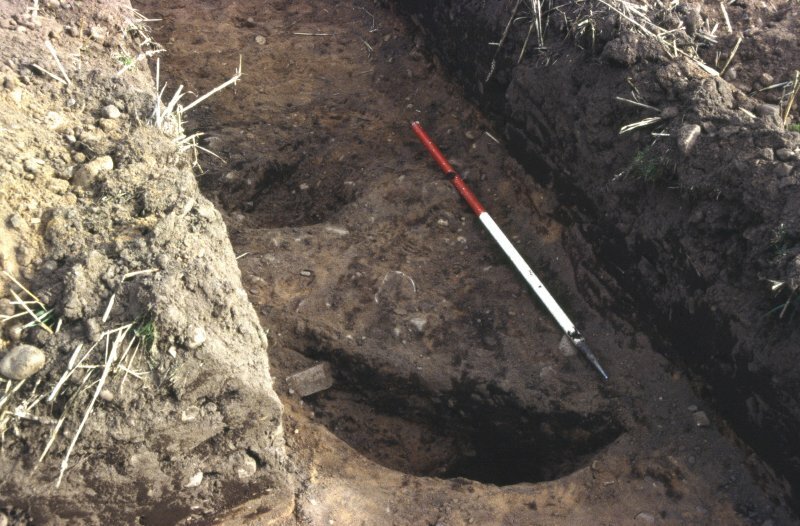 The prime requirement was to define the extent and limits of features of archaeological interest as an aid to future management stategies for the site. 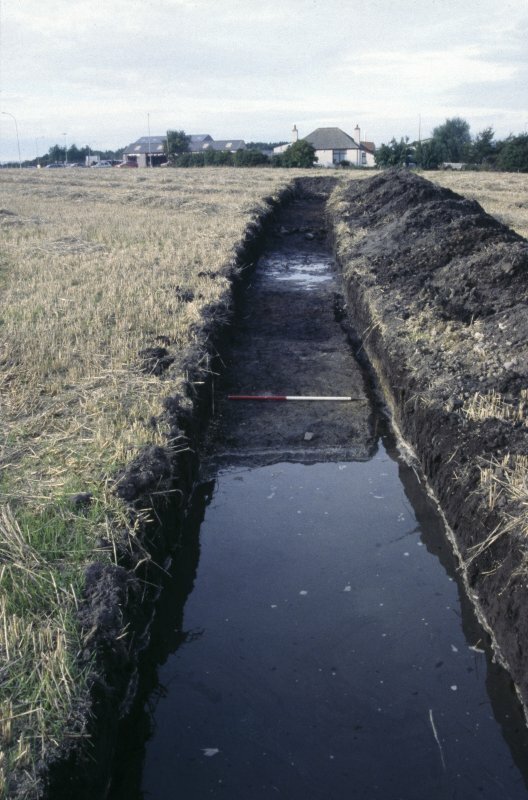 A total of over 900 sq m was excavated in the form of twelve individual trenches. 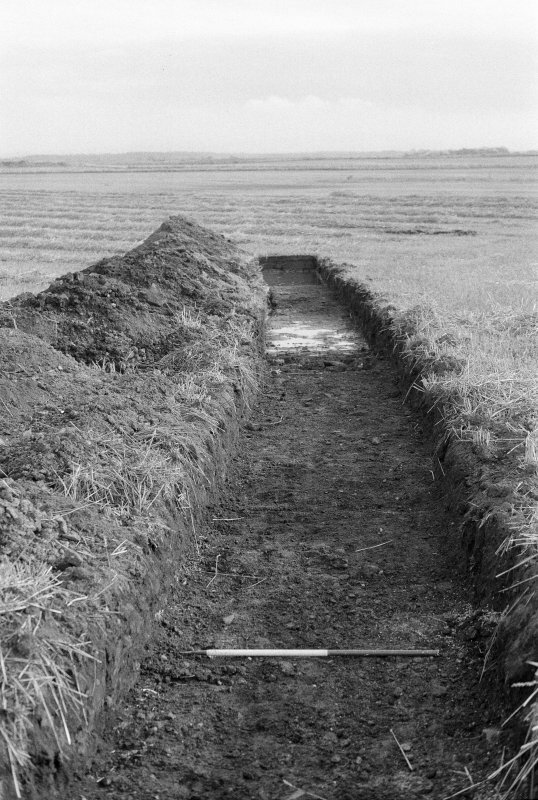 Trenches were positioned primarily around the eastern limits of the known site to the N of the modern cemetery, and on and around the shingle ridge to the S of the cemetery. 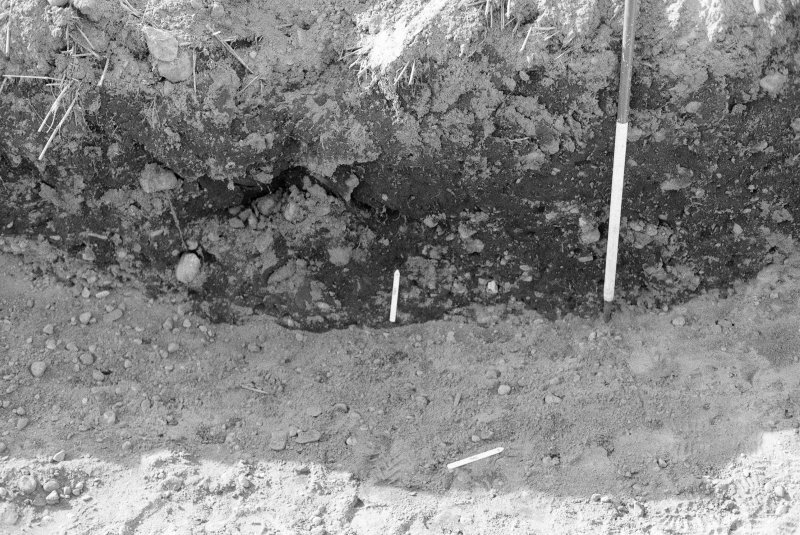 To the S of the cemetery a range of archaeological features were identified. 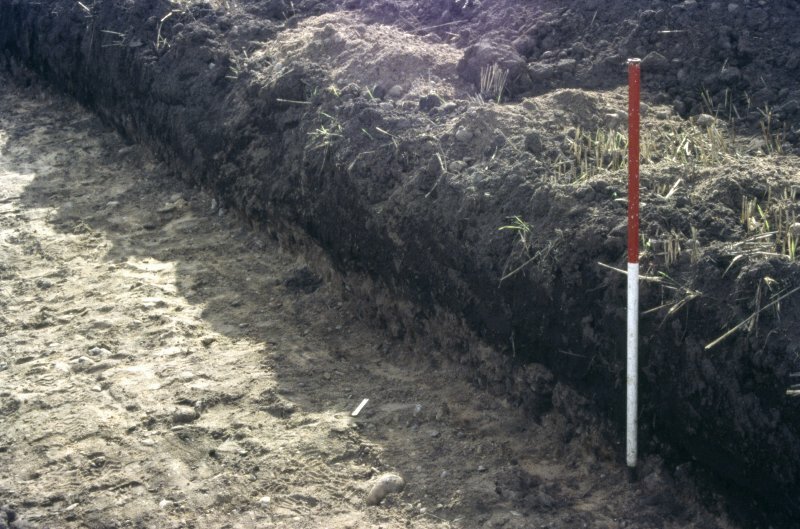 These took the form of pits, dump deposits and cultivation traces. 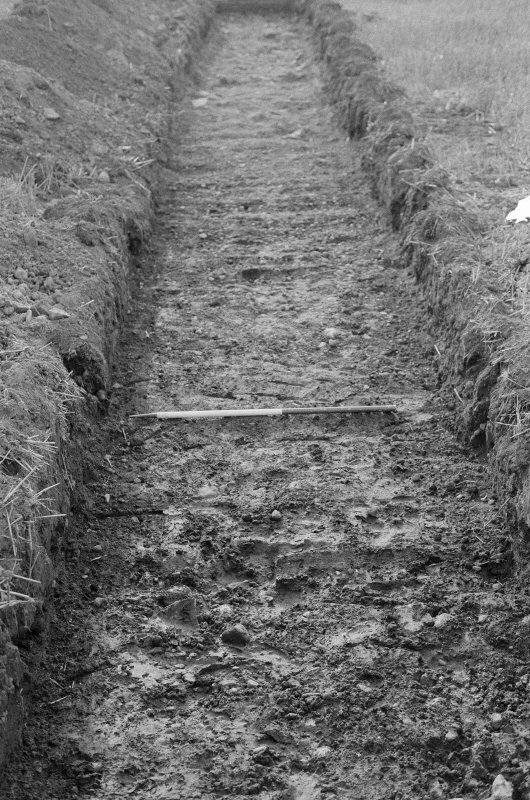 to the N and E of the cemetery trenches revealed traces of a substantial structure. 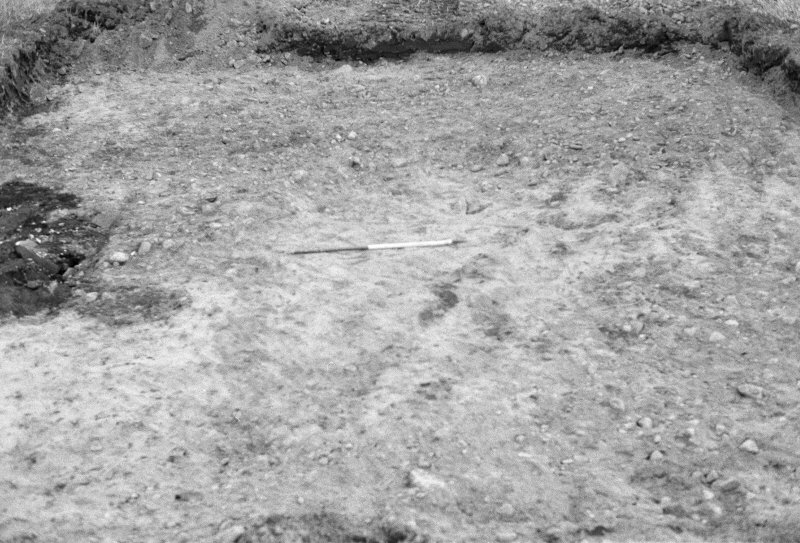 Large walls and ditches were located in three trenches corresponding to documentary and aerial photographic evidence of a concentric hexagonal-shaped structure. 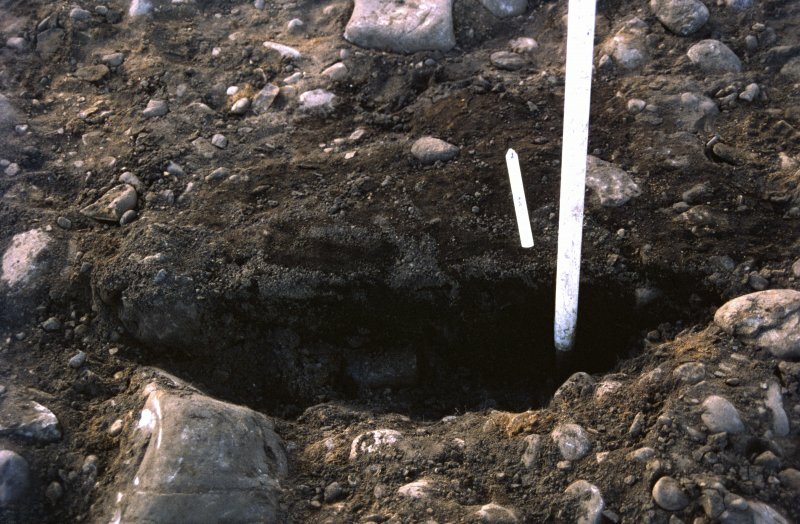 A number of animal bones and sherds of medieval pottery were recovered within this feature. 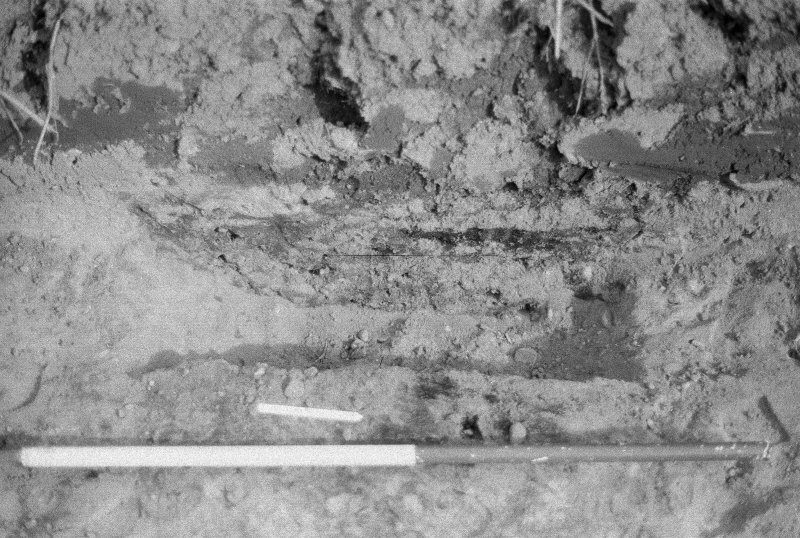 Resistivity surveys conducted after excavation enhanced this picture. 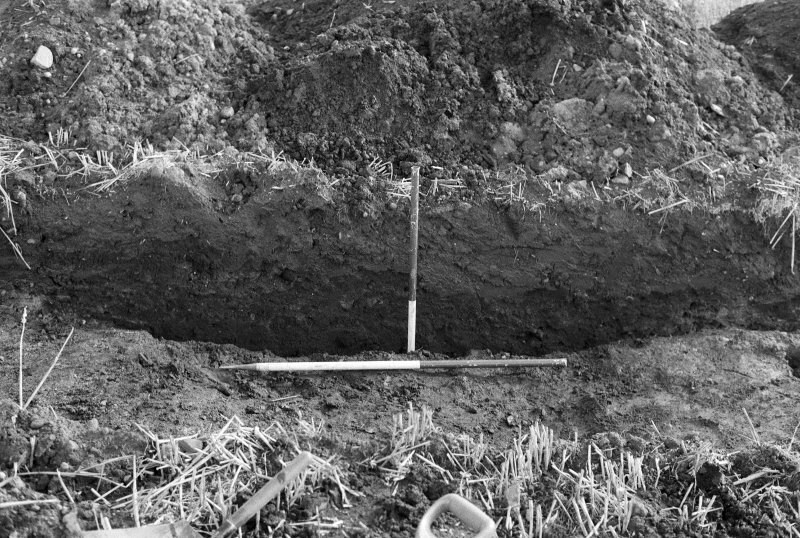 Sponsors: The Moray Society, Moray District Council, Moray, Badenoch and Strathspey Enterprise Company, and Grampian Regional Council. 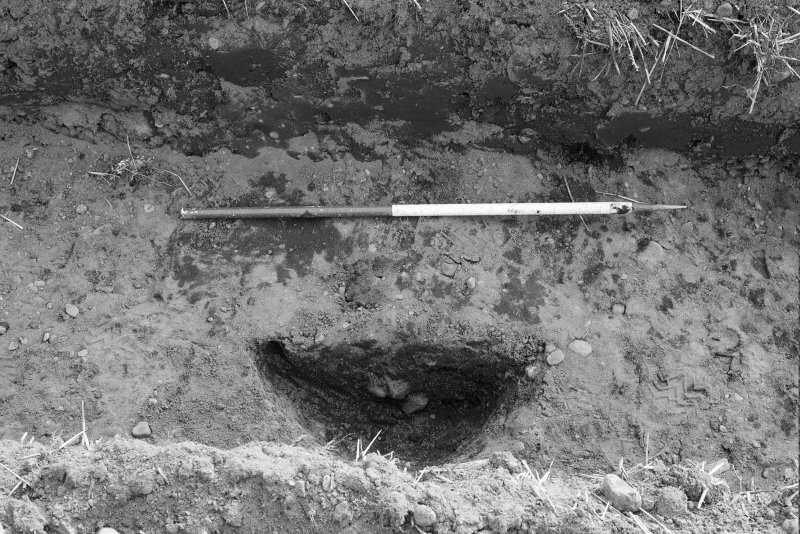 NJ 2230 6960 As part of the Northern Picts Project surveys and excavations have been undertaken in an area stretching from Aberdeenshire to Shetland targeting sites that can help contextualize the character of society in the early medieval period in northern Pictland. 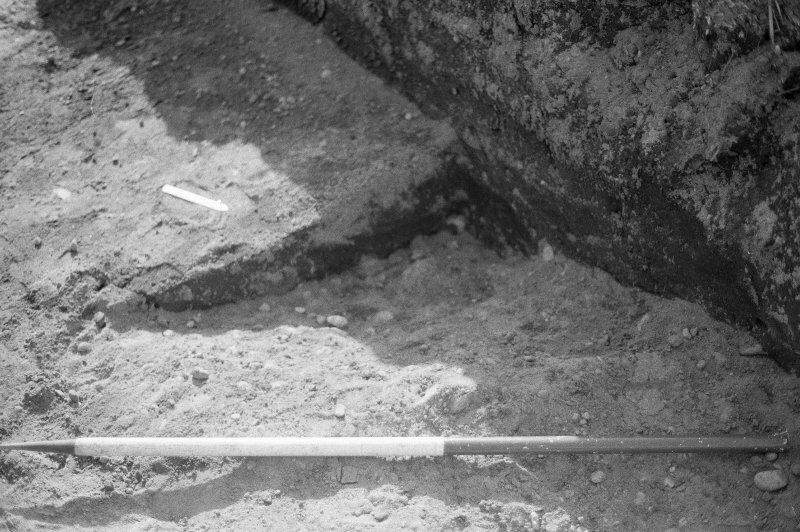 context of this sculpture is an early monastery. 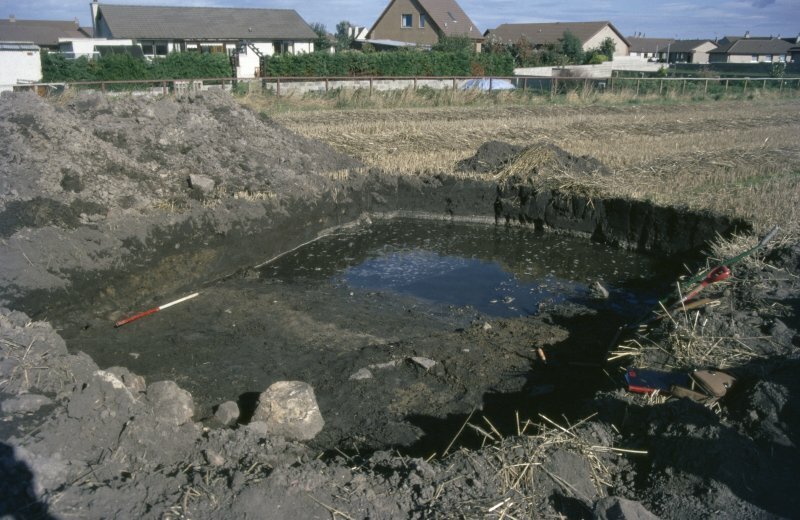 Two surveys were conducted, 28–30 May and 9–11 November 2015, with the aim of identifying any features, such as a monastic vallum around the modern cemetery of Kinneddar. 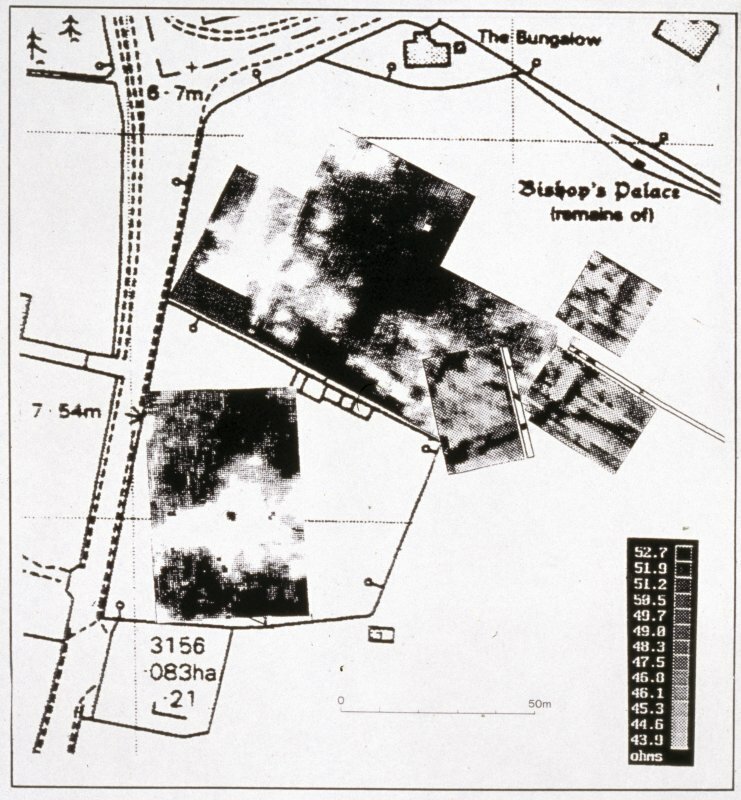 The survey was conducted in the fields to the S and W of the Kinneddar Cemetery and in the scheduled area that covers the supposed site of the Bishop’s Palace to the north. 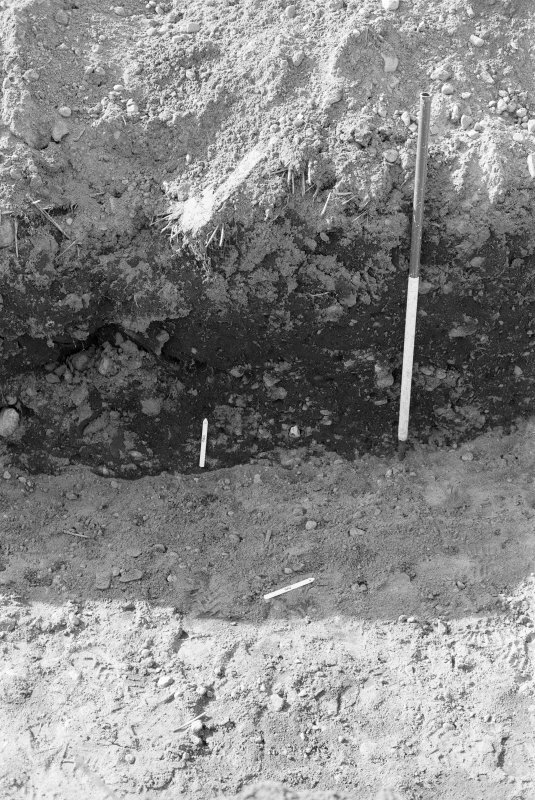 The area N of the cemetery revealed a diverse range of anomalies which confirm the presence of the Bishop’s Palace in this area. 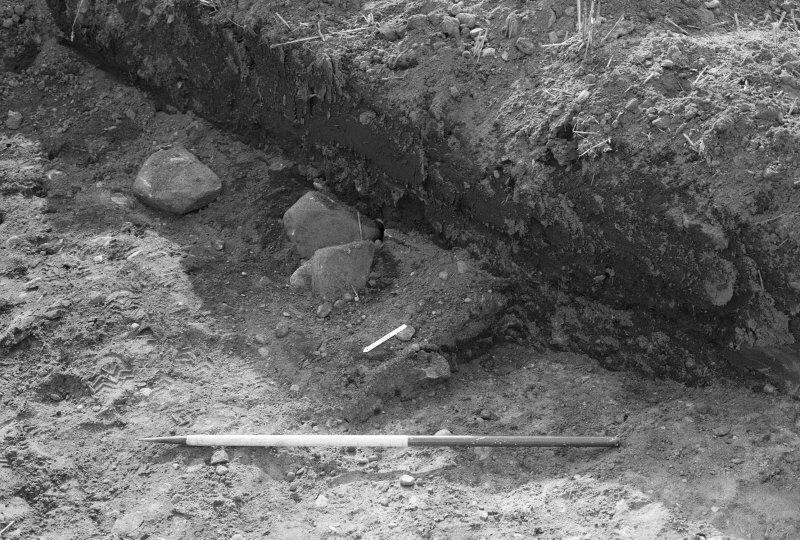 The anomalies hint at wall fragments and extensive remains lying under the modern ploughsoil. 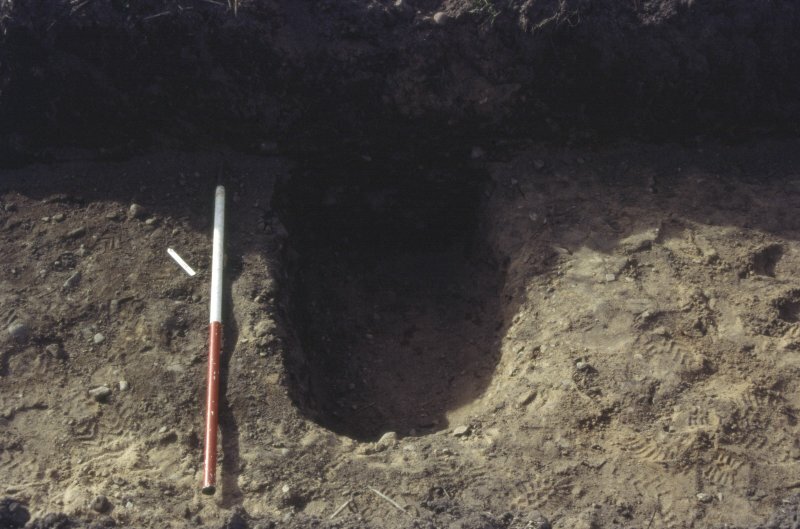 To the S and W of the cemetery the most obvious feature was a large curvilinear anomaly that appears to represent the remains of the monastic vallum. 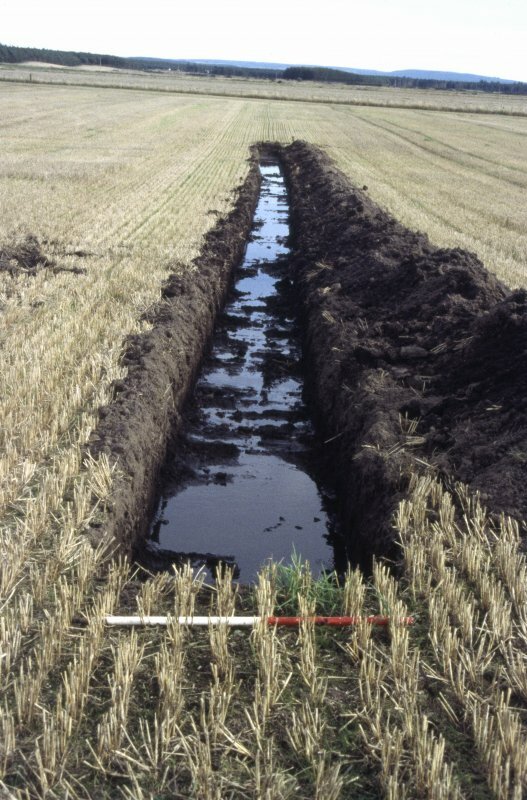 This ditch curves southwards from the Glebe fields and heads SE before curving and extending into unsurveyed fields to the east. 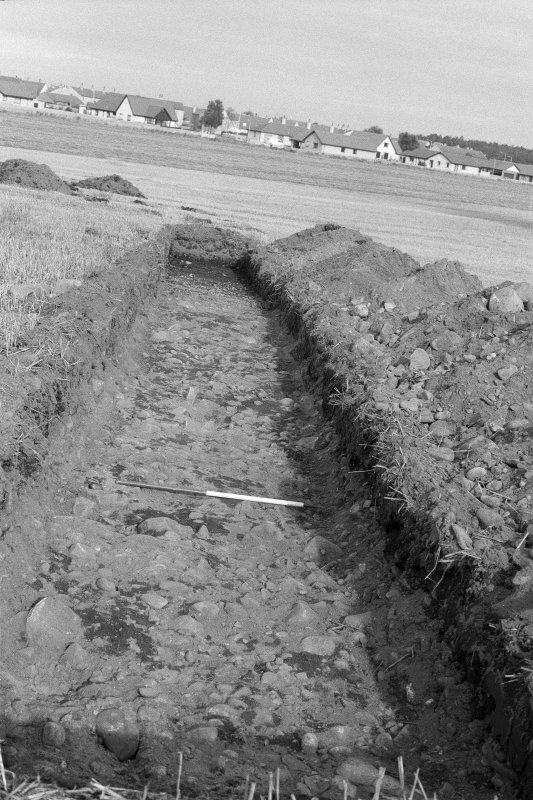 The projected line of the ditch would represent an enclosure c200m or more in diameter. 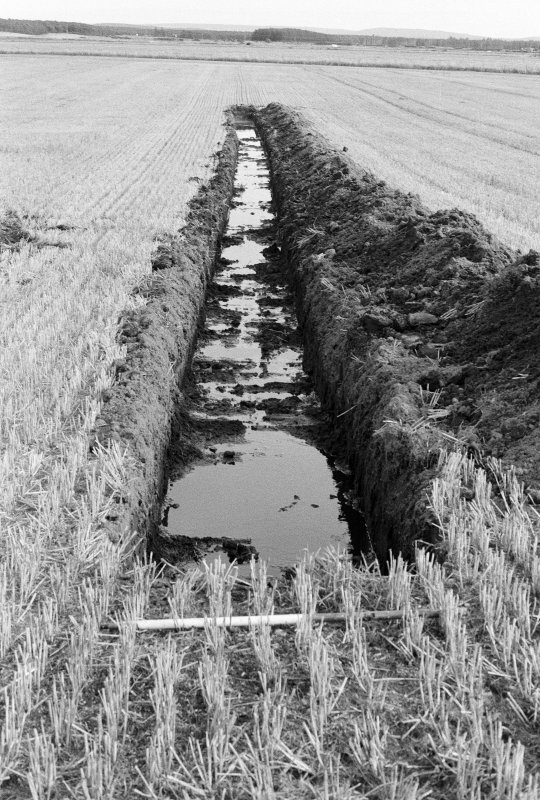 Further additional ditches, both within the possible vallum and to the S, were also identified. 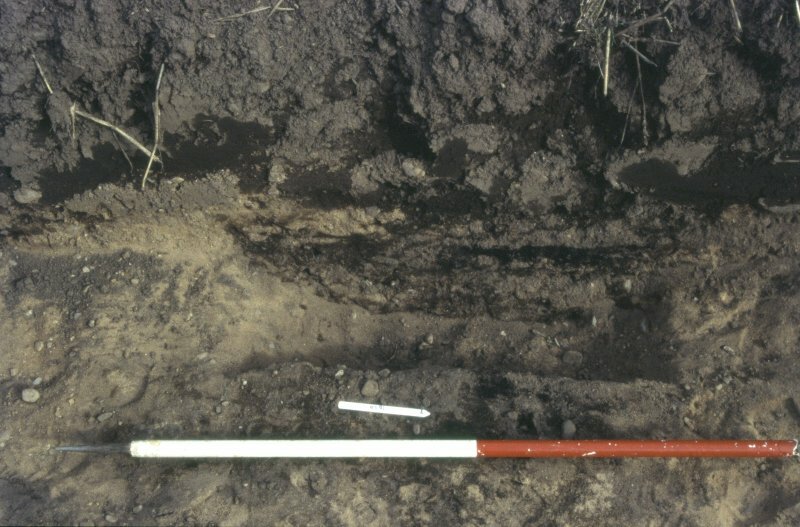 The ditch appears to be more complex or multivallate on the W in the area just outside the Glebe field. 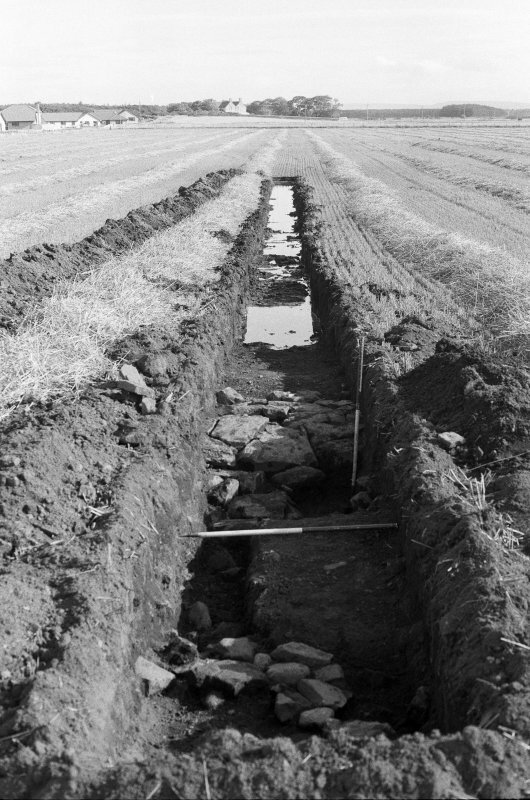 An extensive area of rig and furrow appears to respect the vallum on the west.